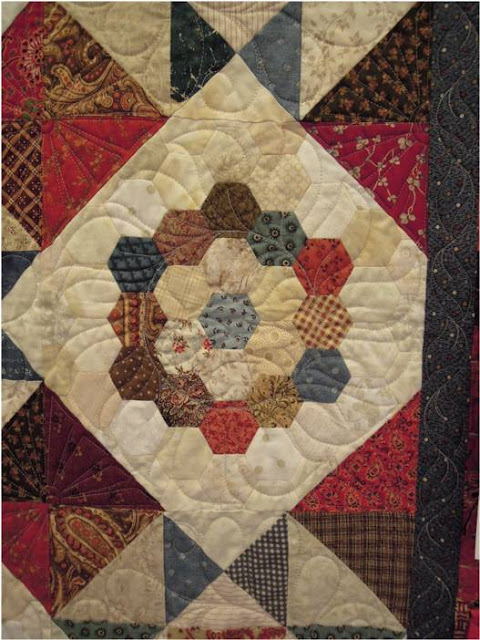 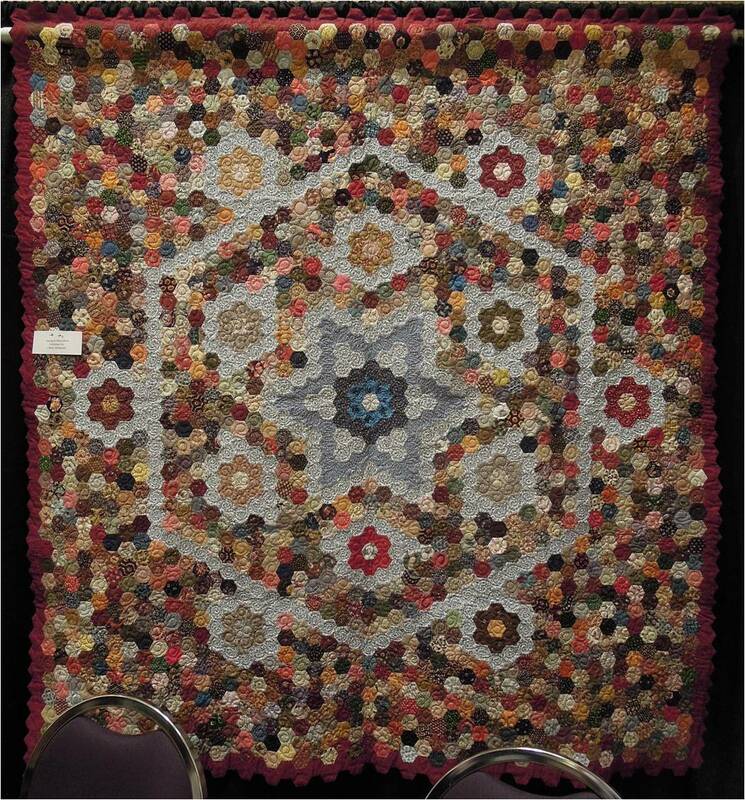 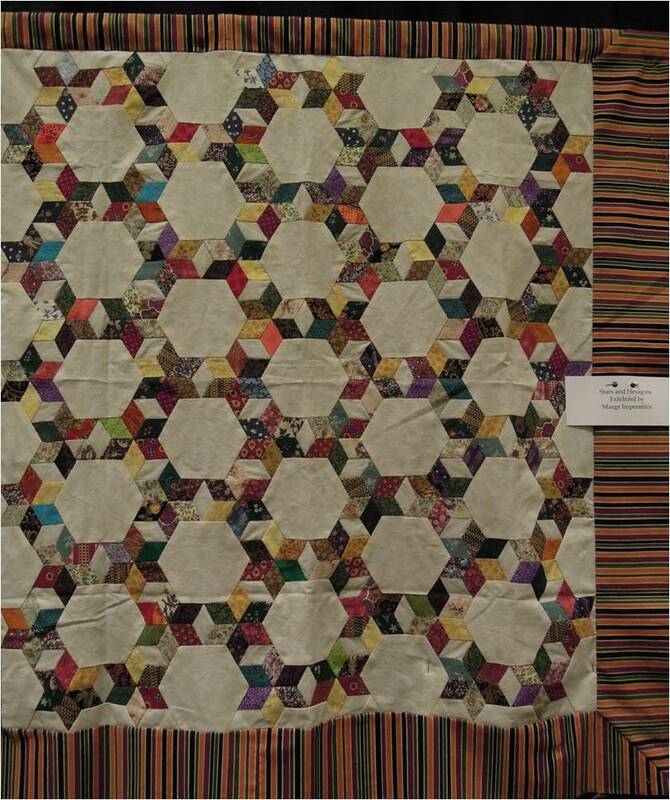 At the recent 2013 Arizona Quilters' Guild Show, we enjoyed a lovely display of vintage hexagon quilts from years past, along with some more recent variations on the theme. 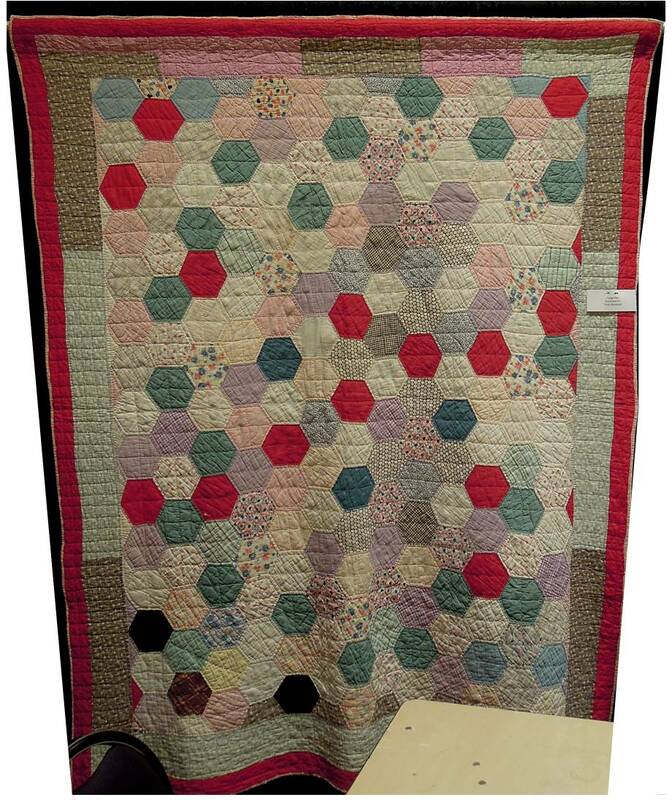 It was heartwarming to see these obviously well-loved quilts, which were in excellent condition. We'd like to share these photos of the hexagons, a geometric shape with 6 sides. 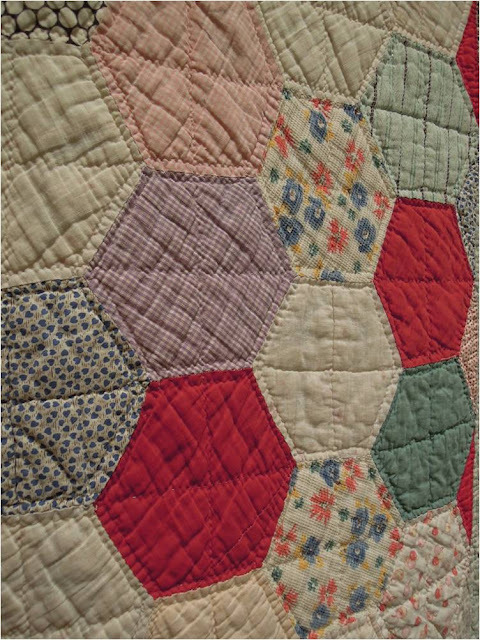 (For information on how to hand-sew a hexagon quilt, please see the excellent instructions from Sharon at Simple Things). 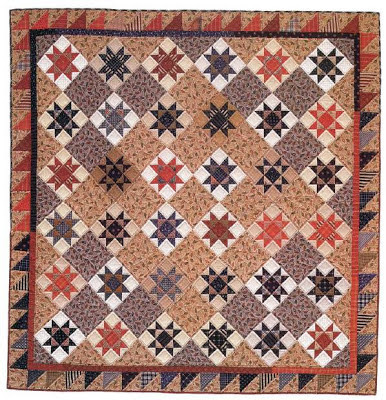 Imagine the work that went into this intricate pattern, done in rich autumn colors of russet, olive green, and burgundy. 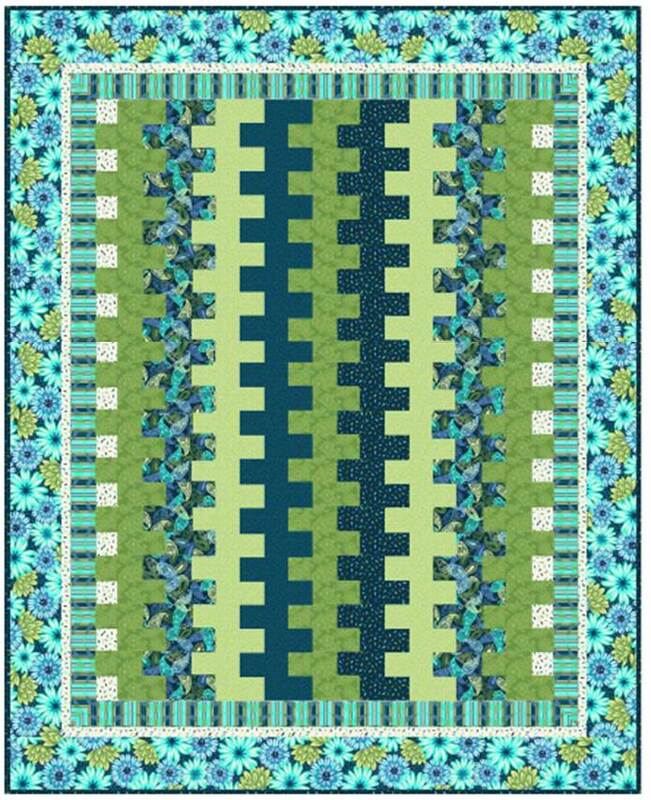 We love the look of all-hexagon blocks here, even the hexagon border, which creates an eye-catching "prairie points" effect. 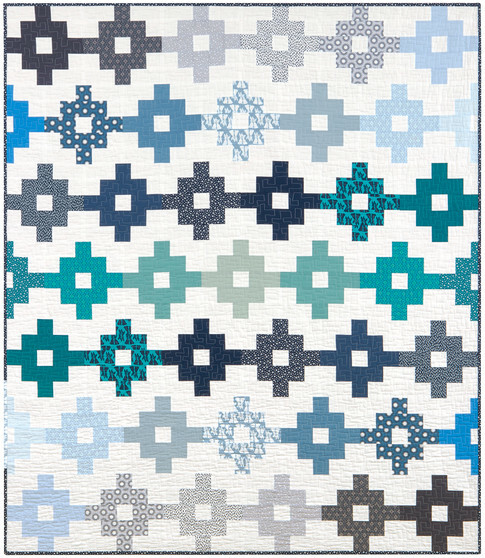 Large hexagons of alternating solids and stripes give an almost "snowball look" to this quilt, which would brighten up any room in the house. 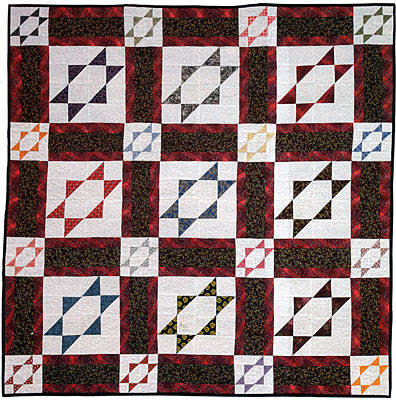 A matching solid red outer border adds to the cheerful effect created by these blocks. 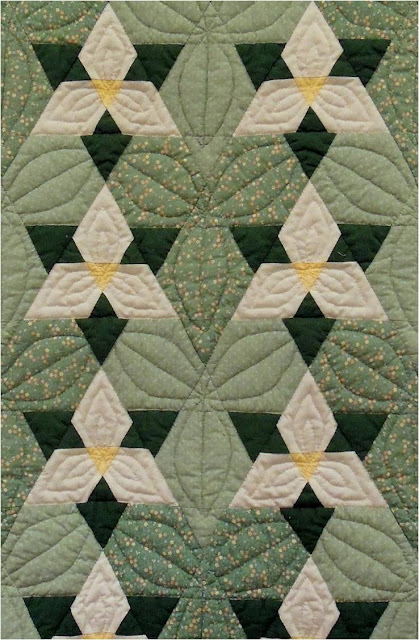 This calm, soothing color motif of sage green and white lilies is comprised of larger hexagons, which are placed point-to-point with triangles in between. It's tricky to discern the way in which the flowers are pieced, as their triangle points of the lilies extend over into the next block. 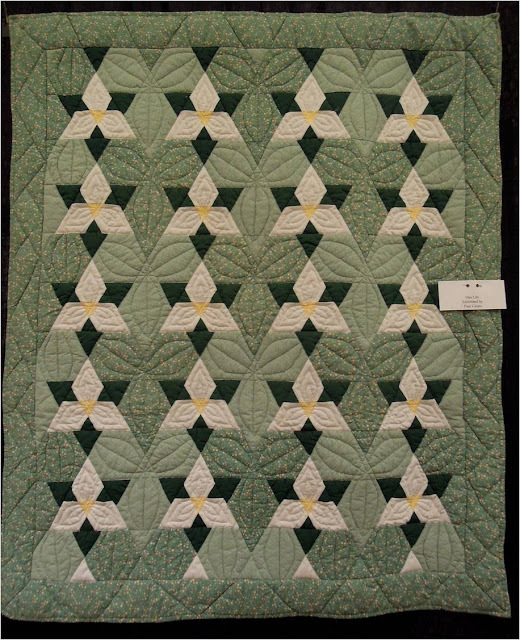 Notice the leaf-shaped quilting pattern which surrounds the center white lily and carries out the floral theme of the quilt. 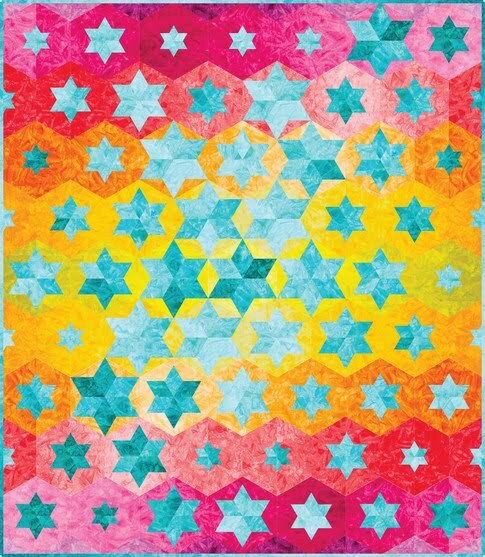 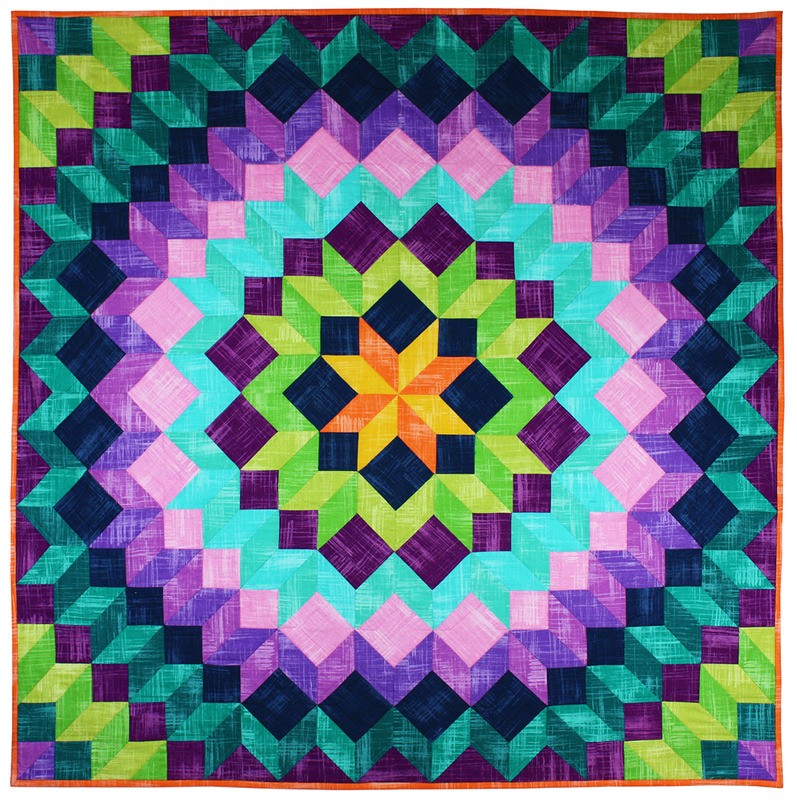 Some people see six pointed stars in the expertly pieced colorful fabric surrounding the large hexagon centers, and others see tumbling blocks tilted on their side. 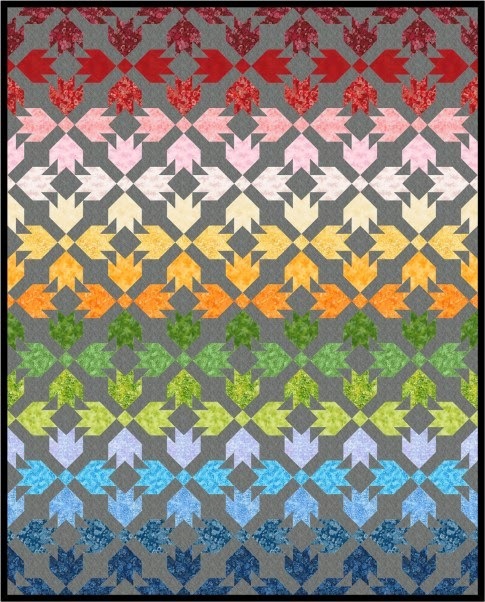 Can your eyes pick out both patterns? 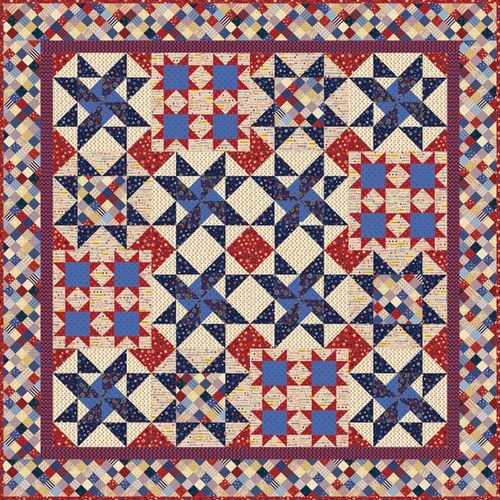 This darling mini-quilt is enhanced by beautiful crewel embroidery around the center of each star, lending texture and a floral effect to these tiny blocks. 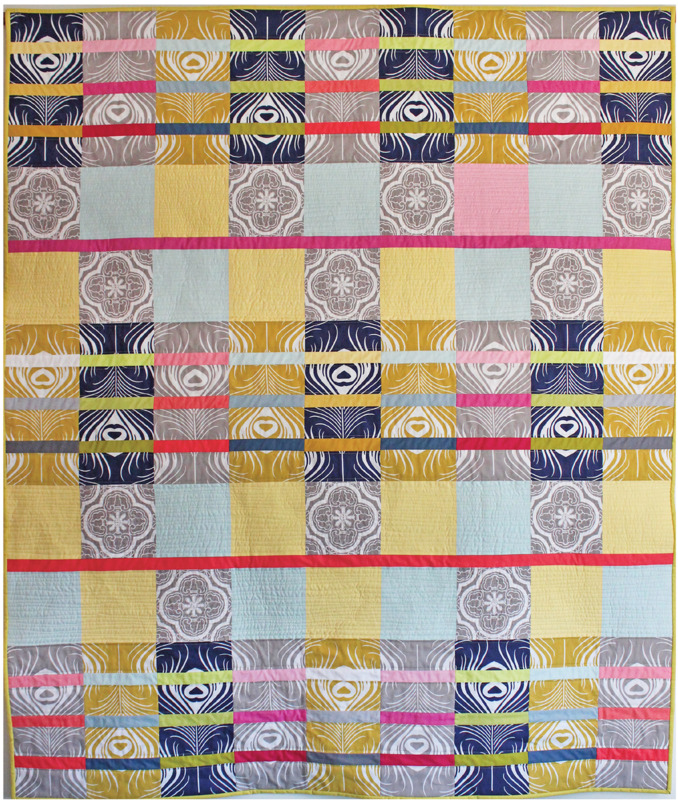 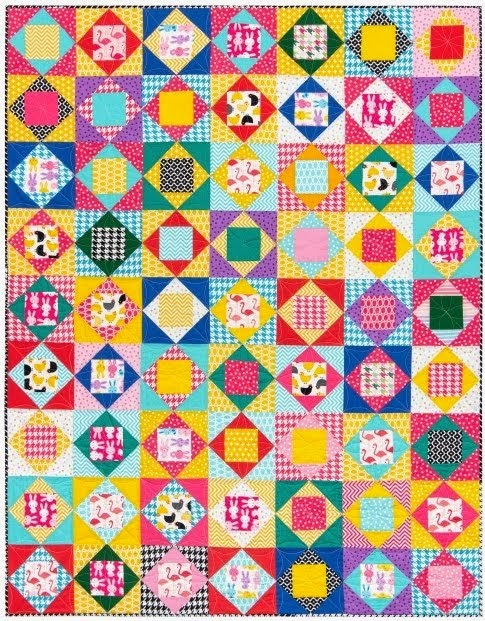 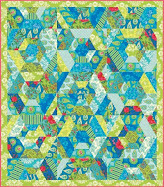 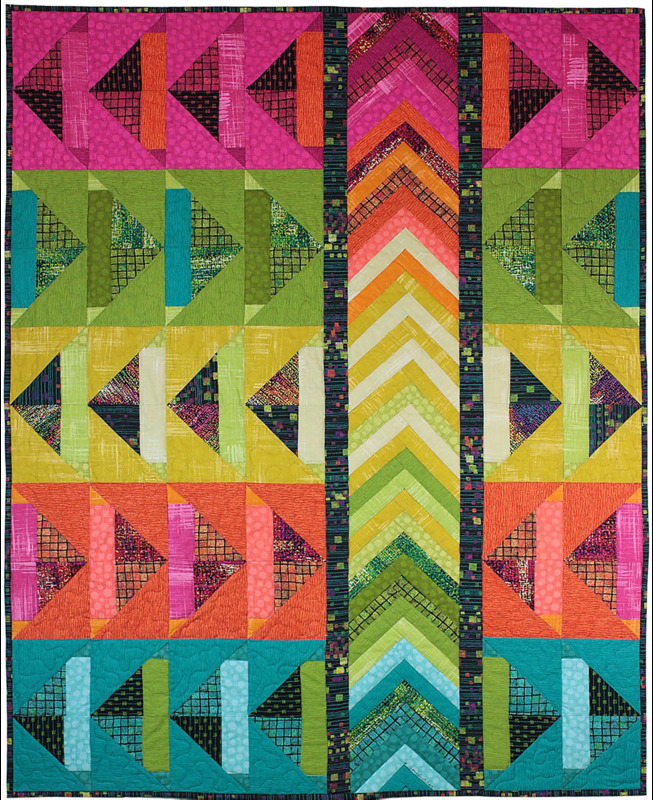 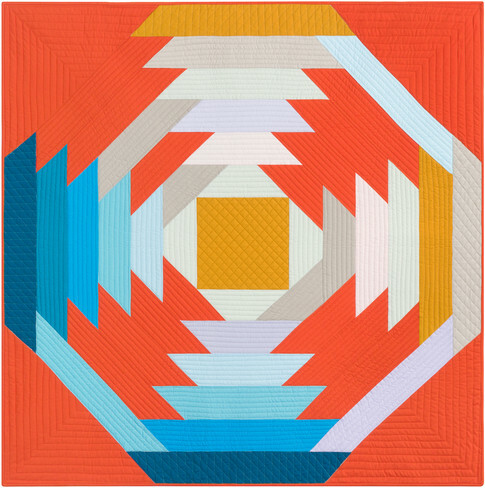 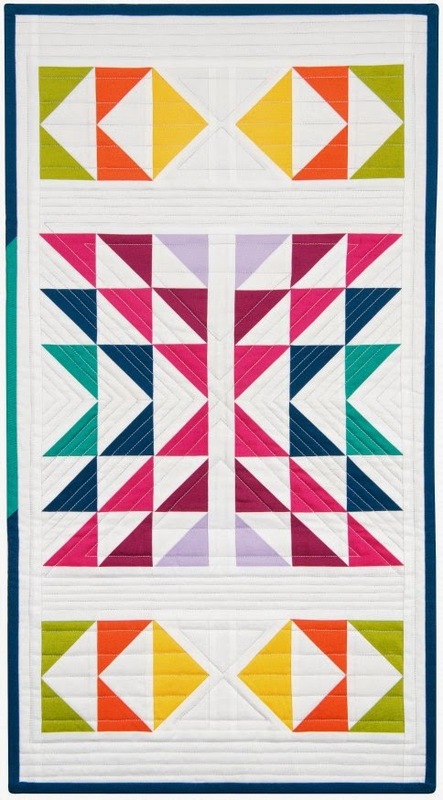 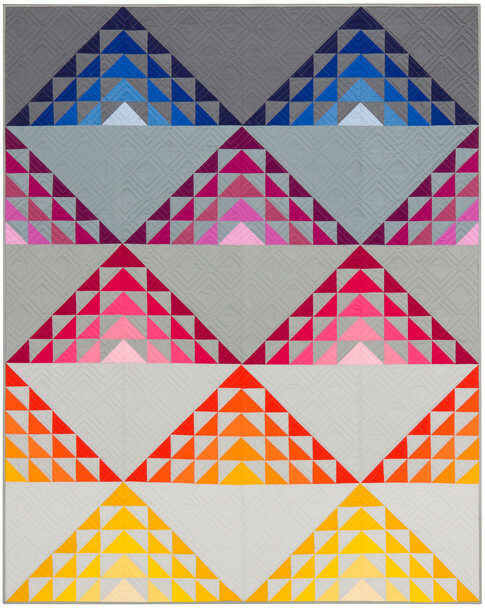 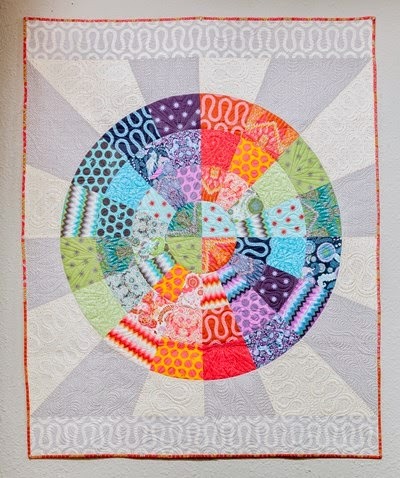 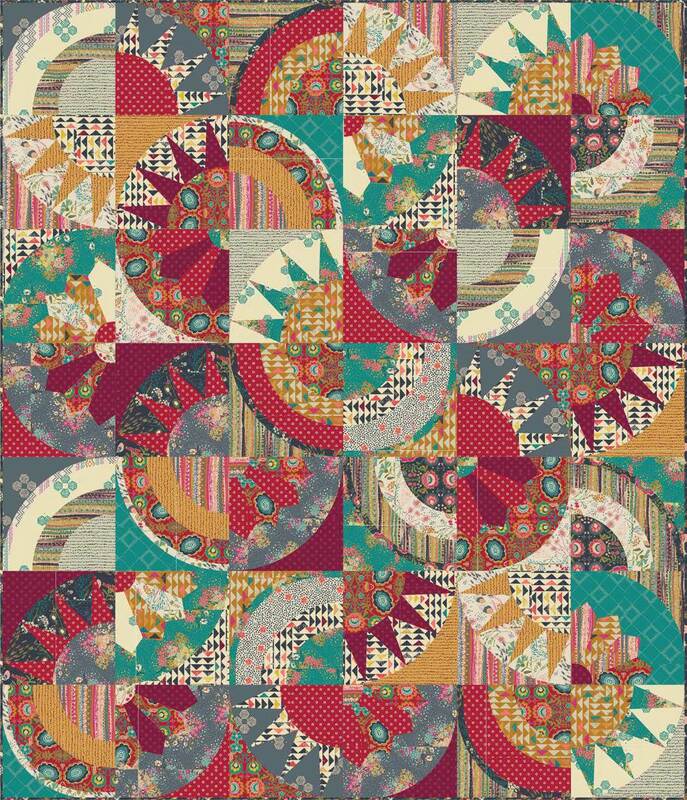 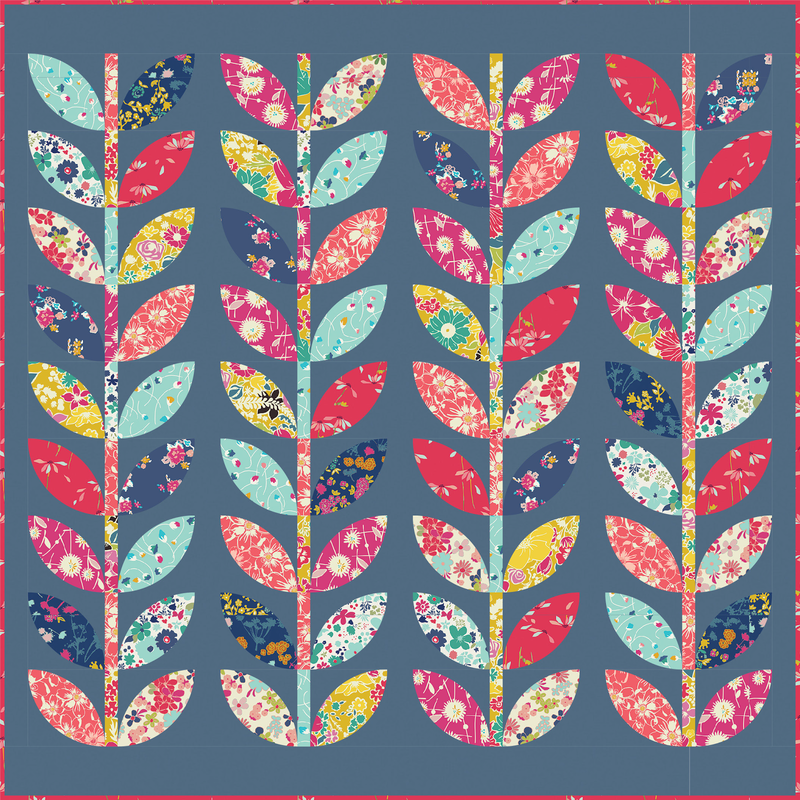 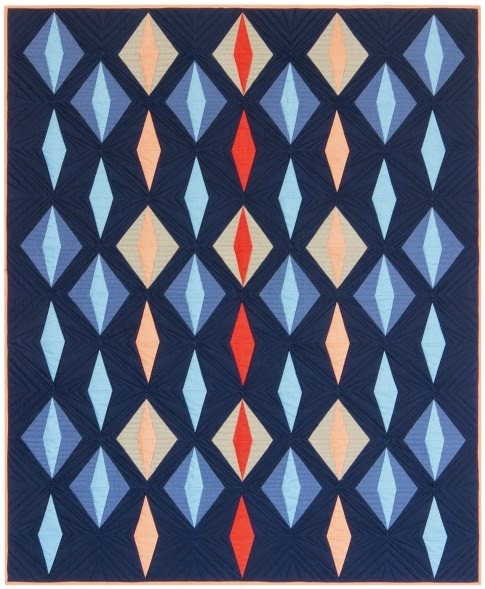 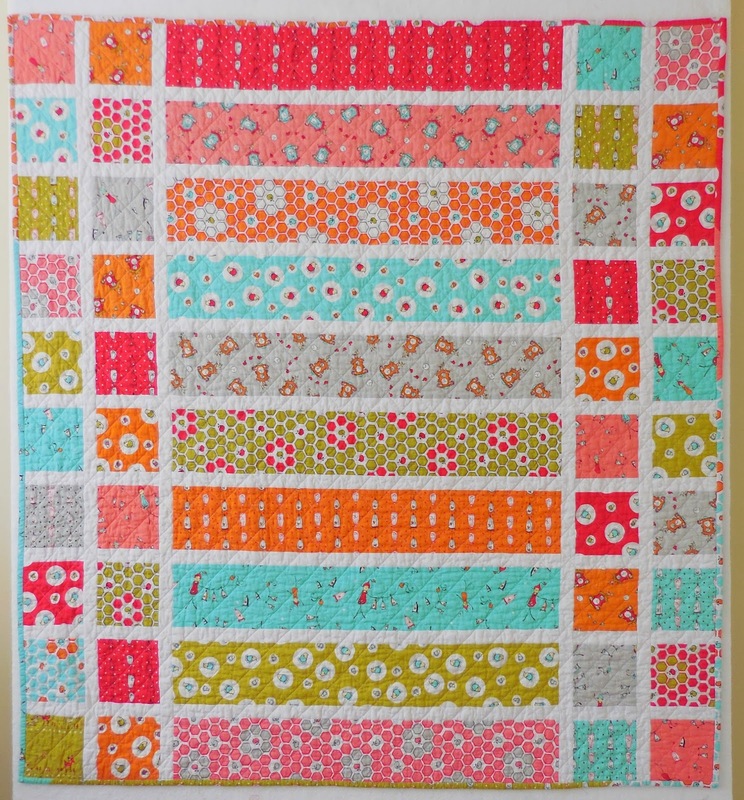 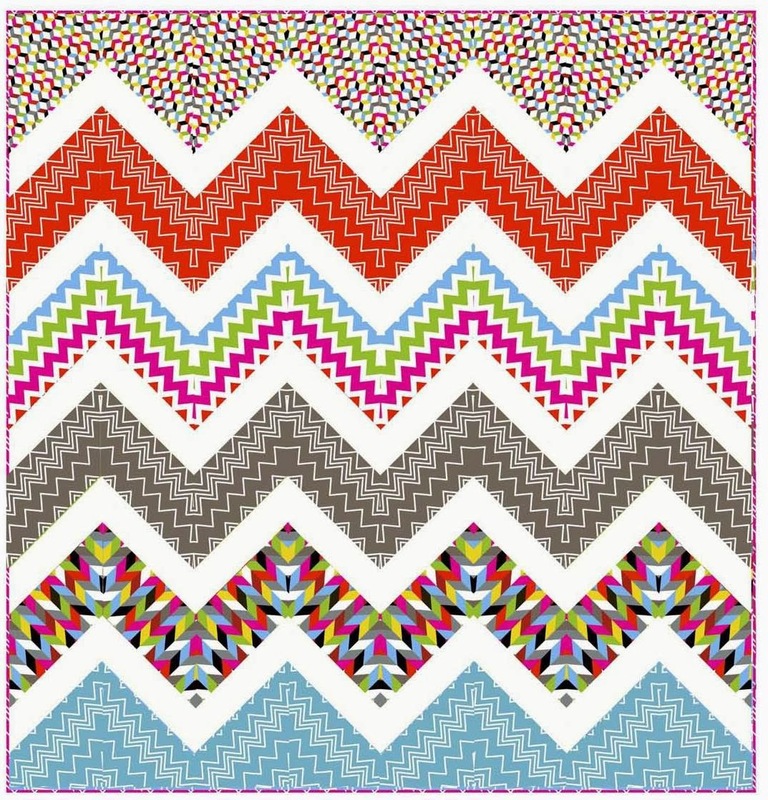 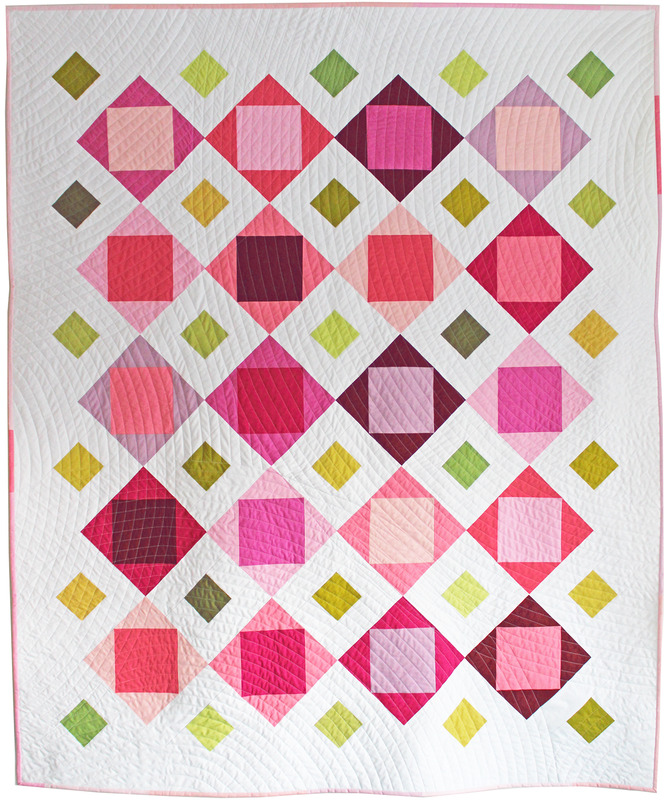 Soft blues and oranges, brightened up by raspberry pink, make this quilt with its zig-zag border so cheery and homey ! 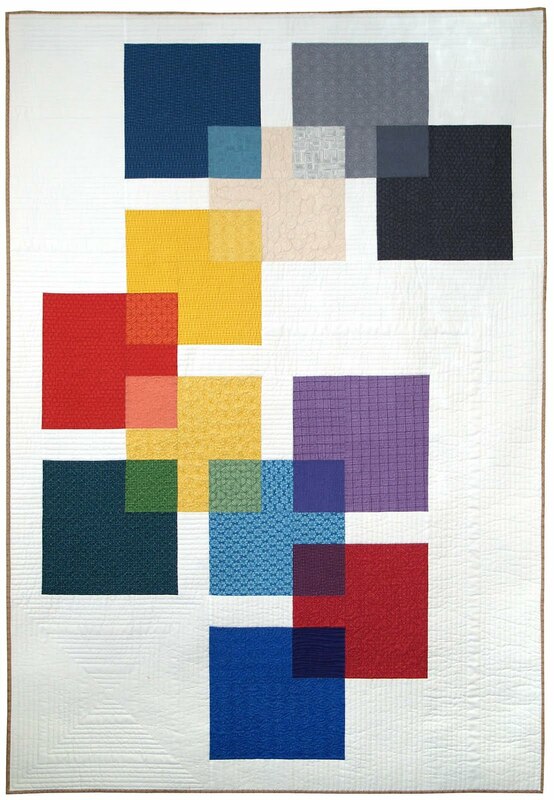 The artist did a wonderful job of selecting fabric colors that created a very pleasing and definitive contrast in each block. 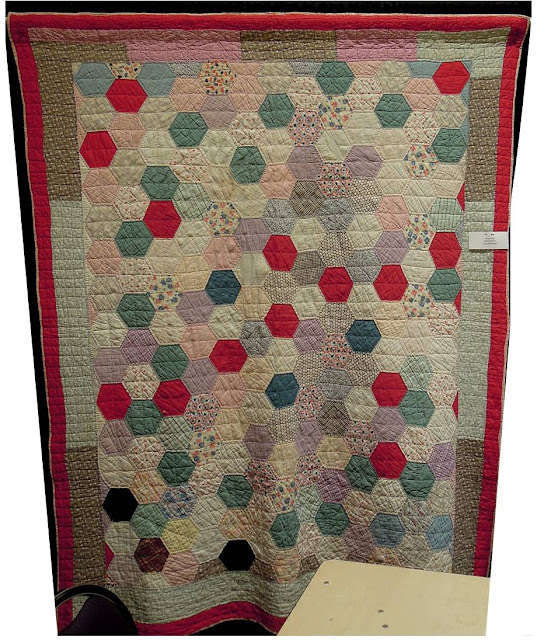 Even though this quilt has seen years of use, you can see the attention that went into what is apparently hand piecing of this quilt. 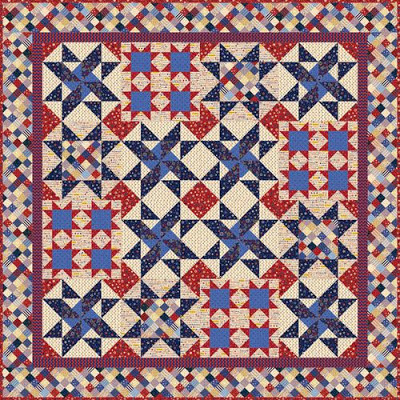 The fabric may have been very soft, loosely woven, and without much stabilizer, but still the quilter put a lot of loving care into making sure that the centers of the star met as closely as possible. 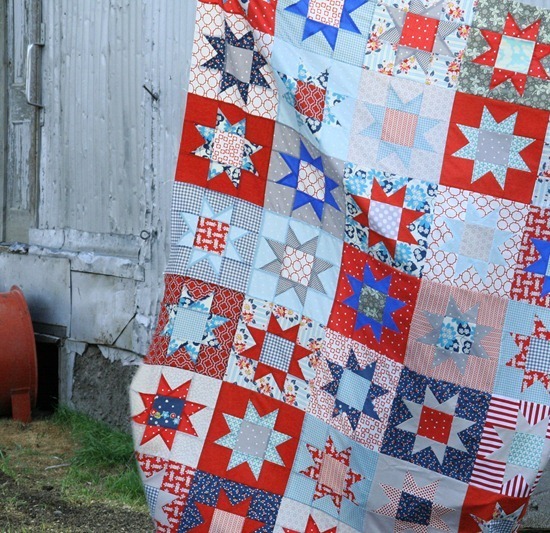 We will always admire the patience and dedication of our quilt-making foremothers. 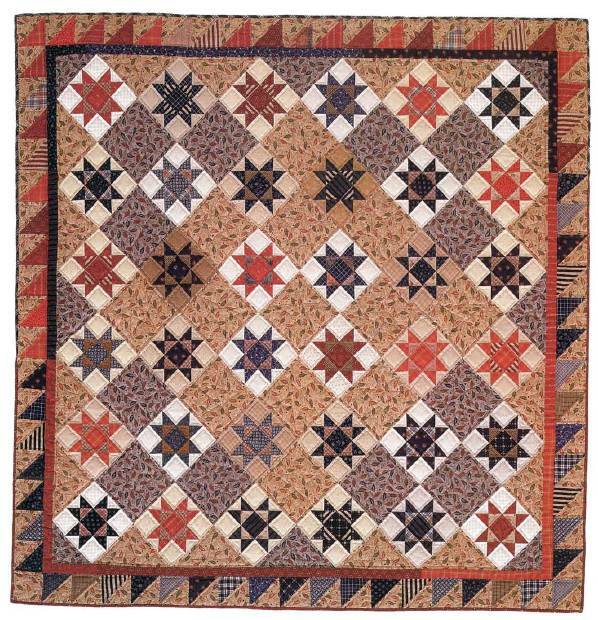 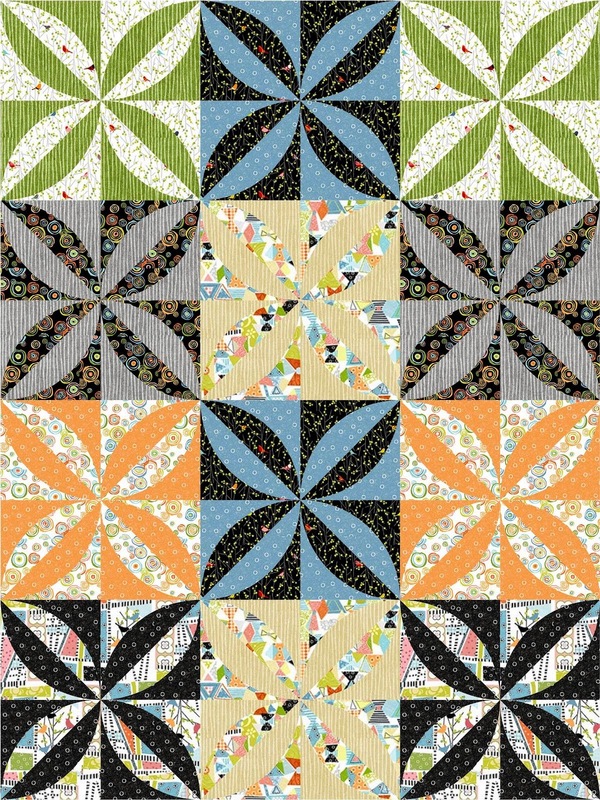 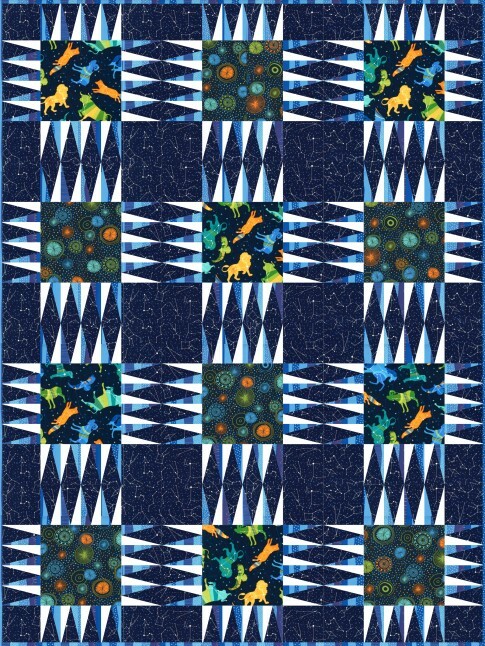 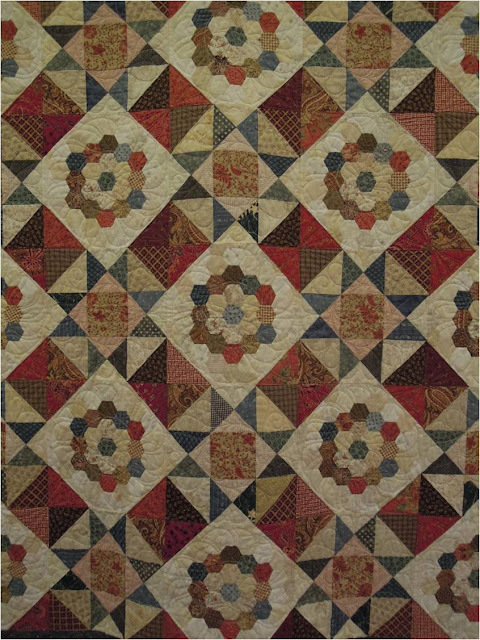 Set "en pointe", these blocks in the Ohio Star pattern, alternating with hexagons and quarter-square triangles create a more contemporary, modern look to this traditional pattern. 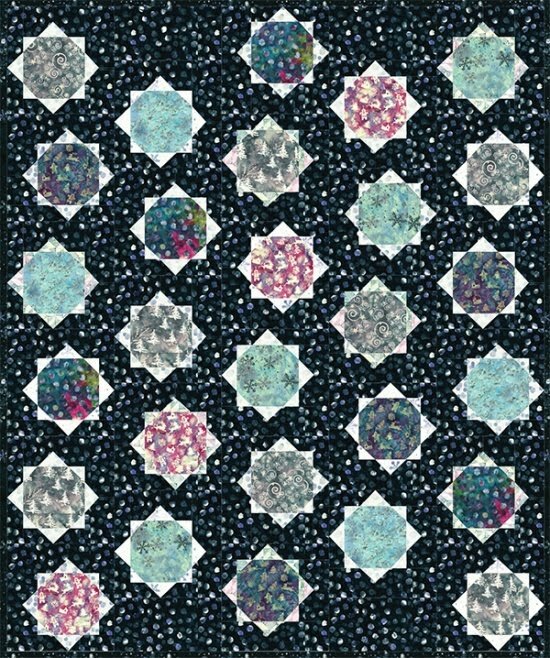 Soft blues, reds, taupes, and cream hues create a gently sparkling effect and cause the hexagon "flowers" to really pop out as the focal points. Look at the pretty quilting pattern on the background surrounding this hexagon flower ! 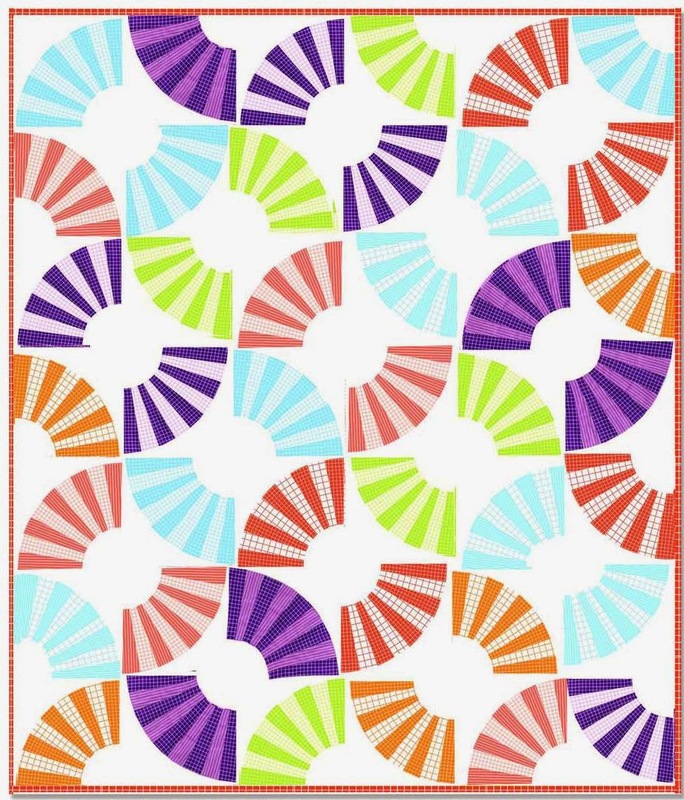 This curved pattern perfectly complements the strong geometric lines of the surrounding blocks. 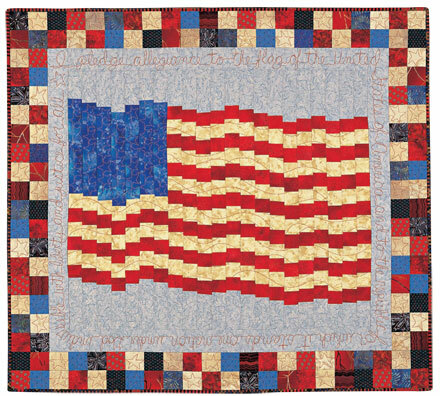 Memorial Day is a time to remember the more than one million men and women who have died in military service to the USA. On this day the flag is lowered to half-staff, where it remains until noon. 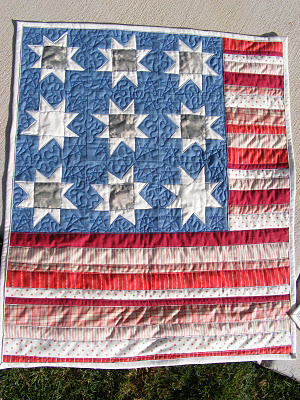 This lovely flag quilt is quilted with the lyrics to the national anthem. Lucy Wong-Leonard, who pieced and quilted Old Glory, says: "This quilt is to commemorate the Chinese veterans of WWII, disabled veterans, and the fallen." 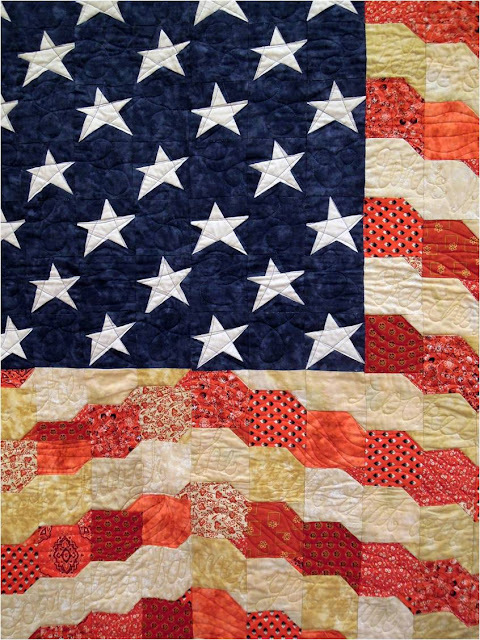 Metallic thread was used to quilt the words of the U.S. National Anthem in the cream-colored areas. 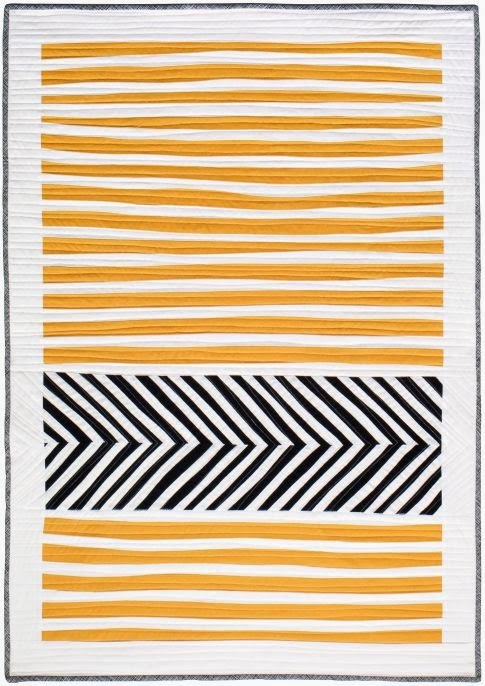 We love the use of cream and orange-red for the "stripes". 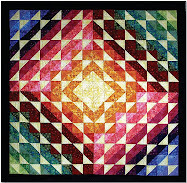 The red-and-cream pieces are offset as in a bargello quilt to create the wavy lines across the surface of the quilt. 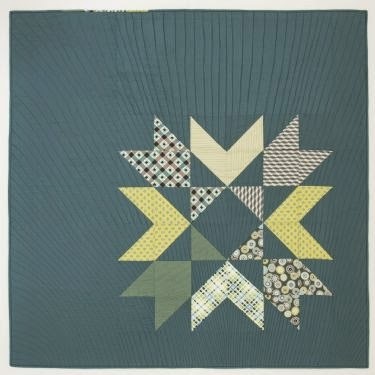 However, instead of using straight squares, each block was made by sewing a small triangle in one corner of the square. 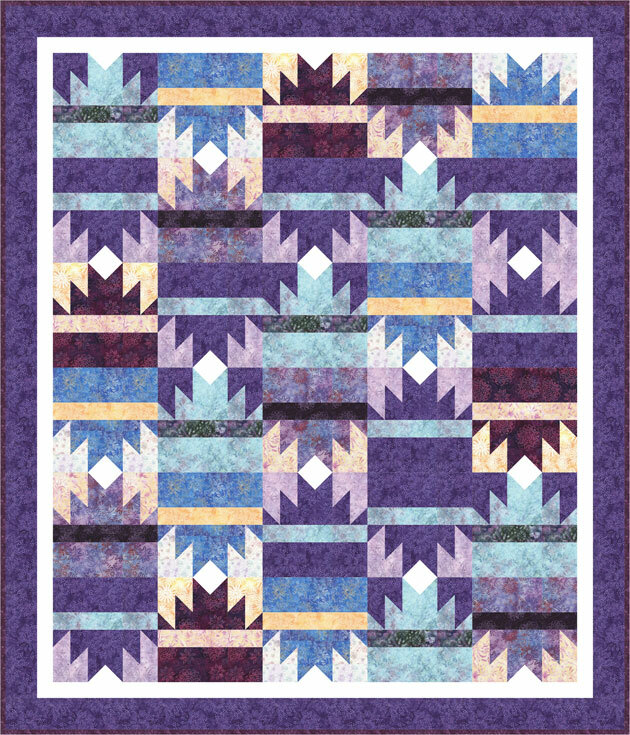 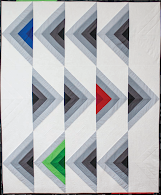 This creates smooth lines rather than the jagged look of a typical bargello. 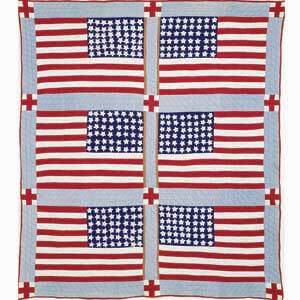 It is all but forgotten that 20,000 Chinese Americans served in World War II. 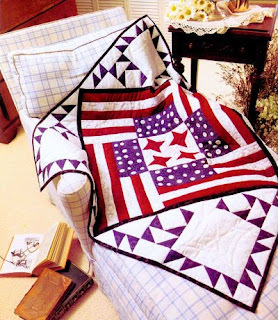 Their all-Chinese American units served a special mission: to assist American Flying Tigers pilots and train Chinese Air Force ground crews to defend against Japanese invasion. They flew the "Hump" (the lower range of the Himalayan mountains), drove the legendary Burma Road, performed troop transport, repaired planes, and did crash recovery. 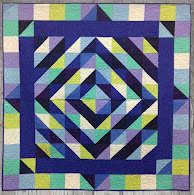 For more information and photos see this article by Victoria Moy. 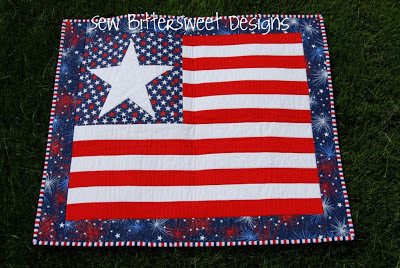 Image credits: Photos are by Quilt Inspiration. 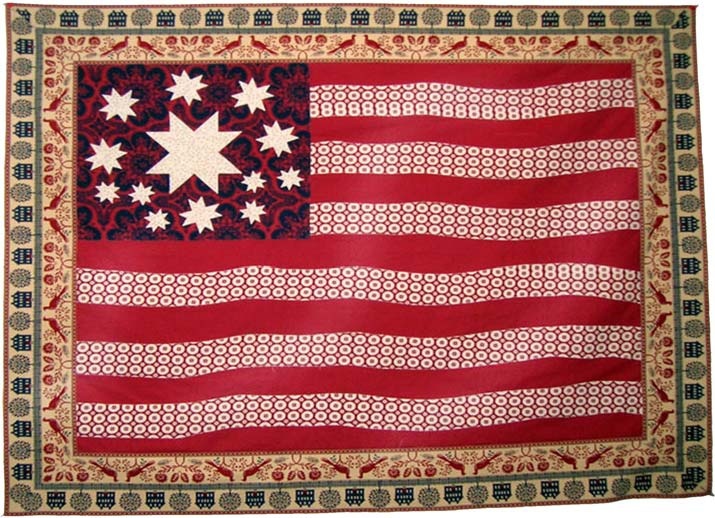 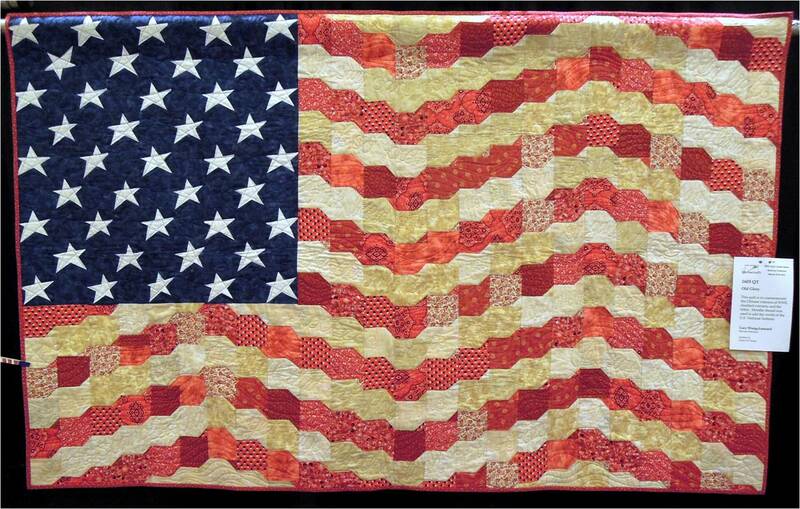 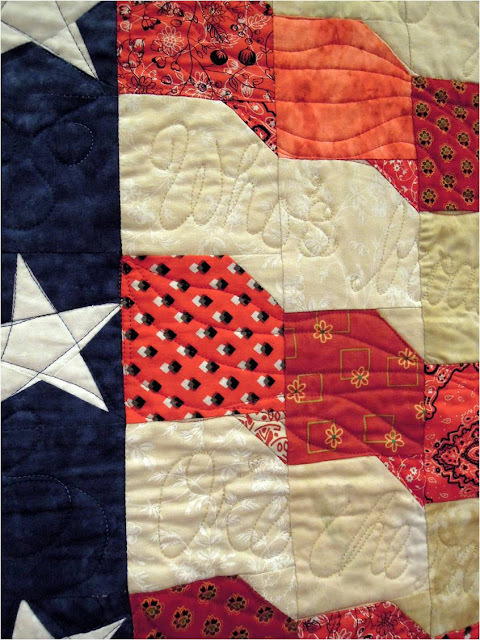 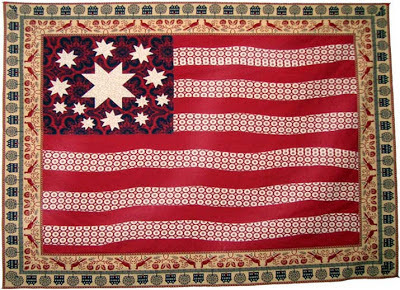 "Old Glory" was shown at the 2013 Arizona Quilters Guild show. 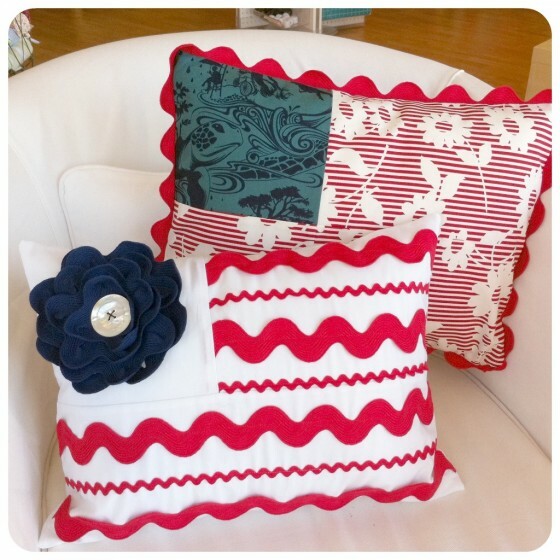 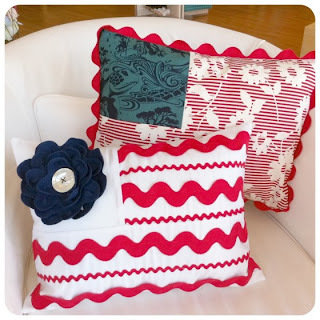 'Tis the season for red, white and blue ! 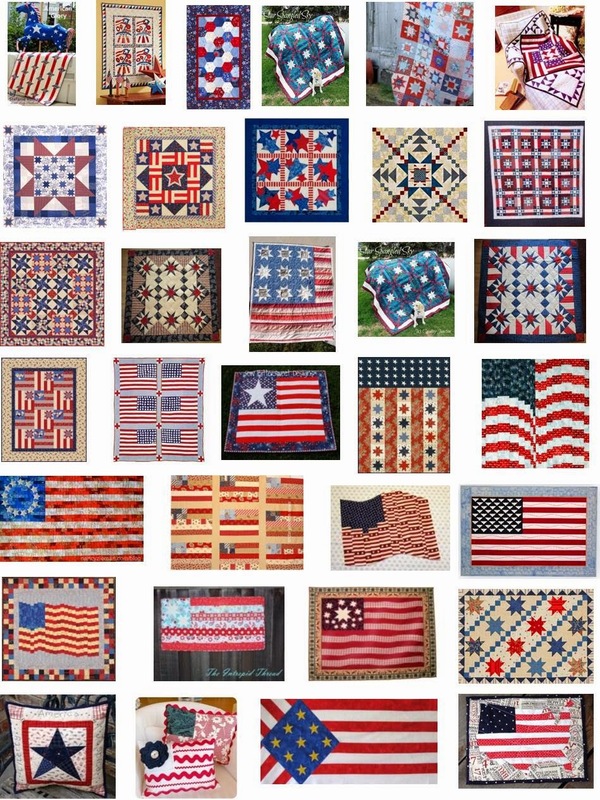 Memorial Day, Flag Day, and America's Independence Day are just around the corner. 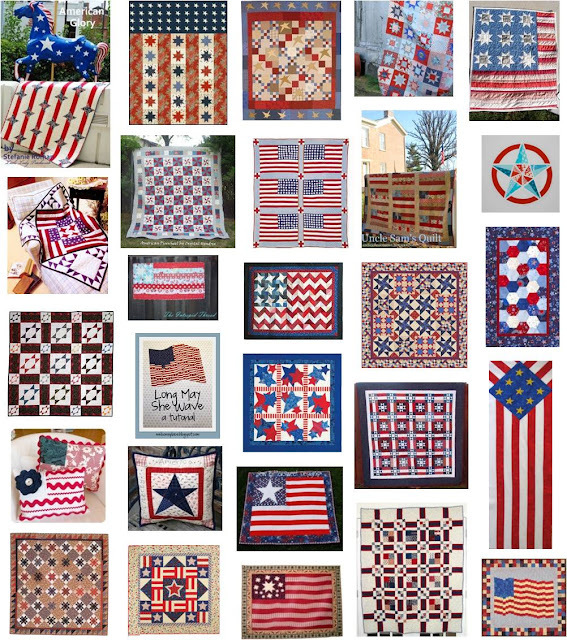 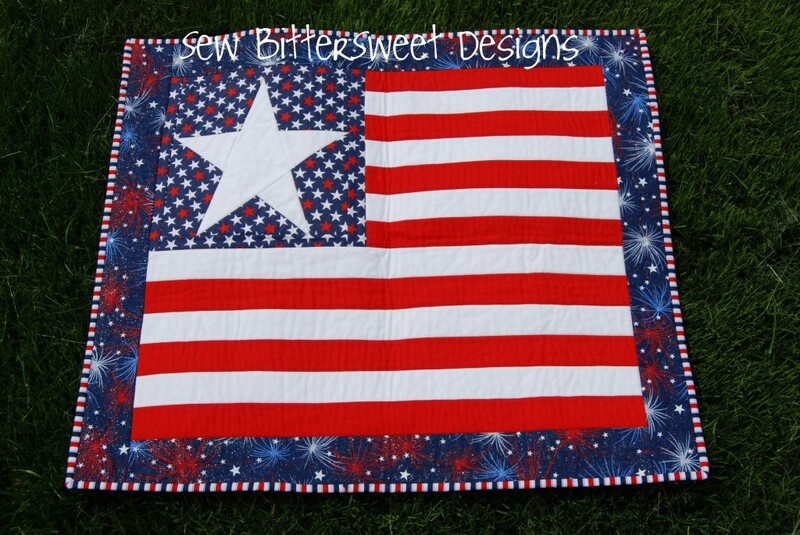 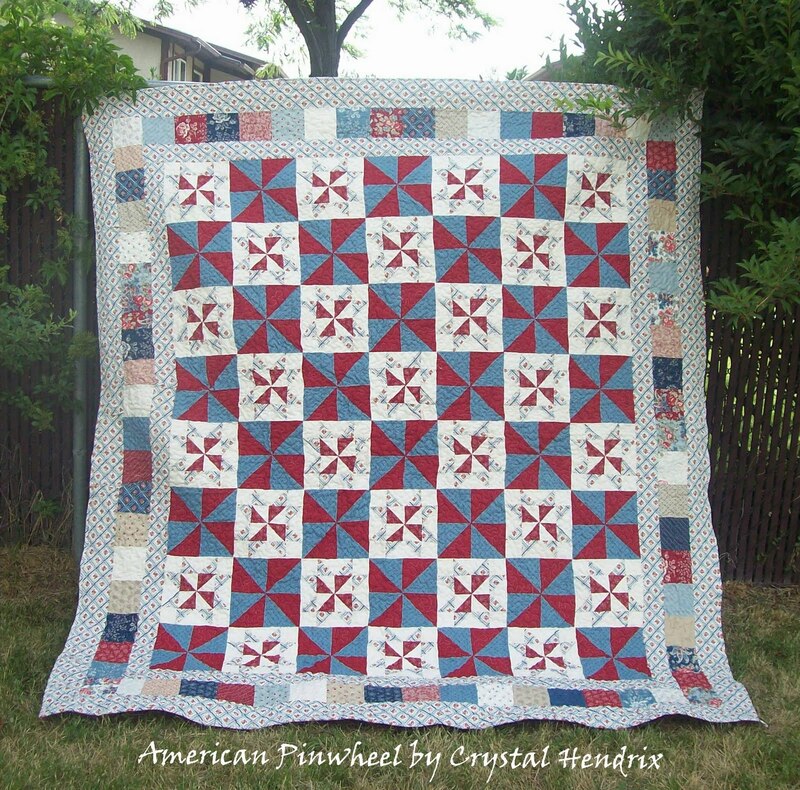 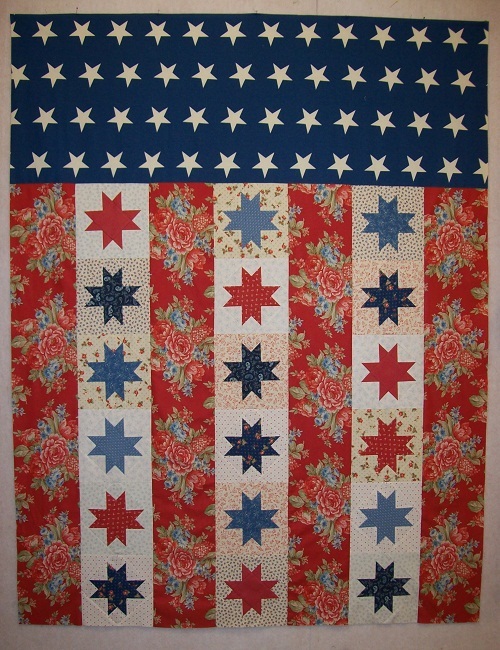 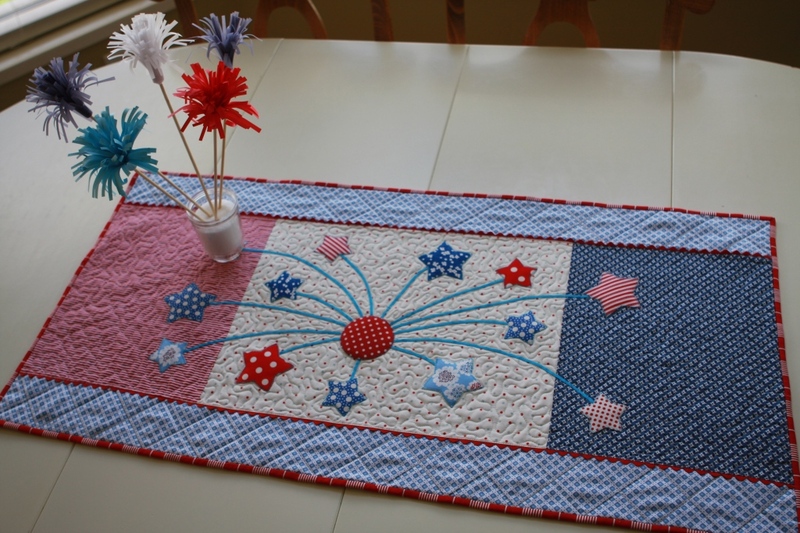 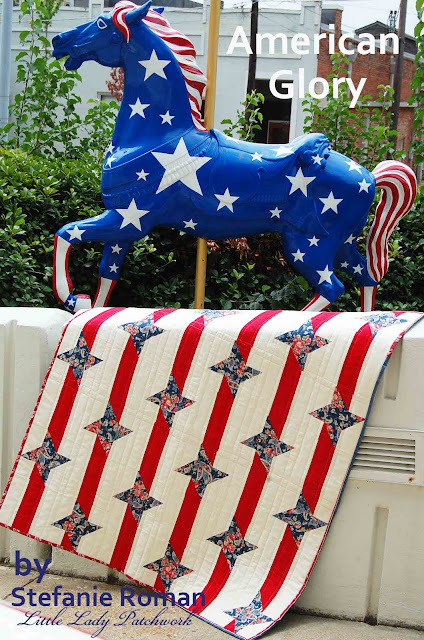 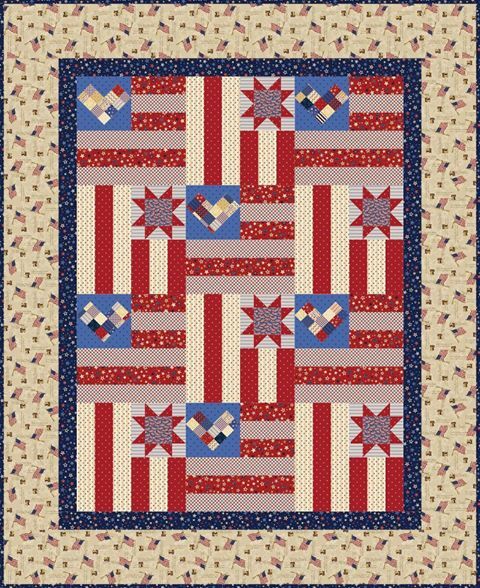 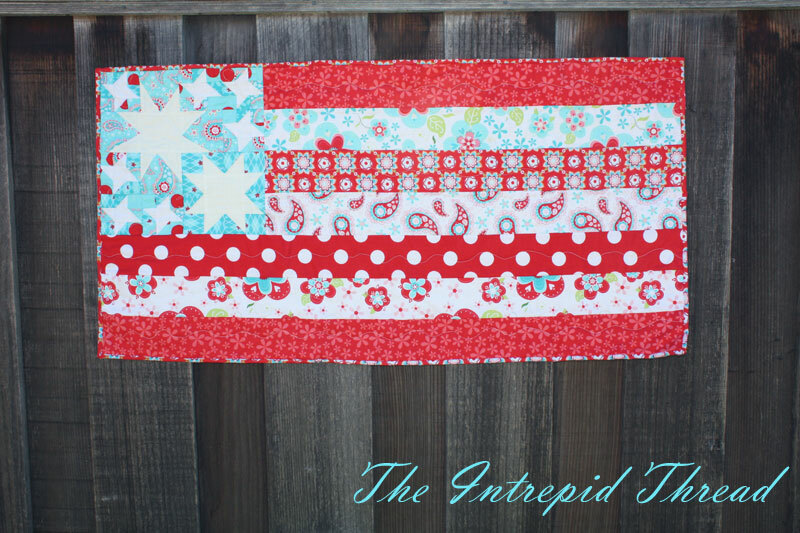 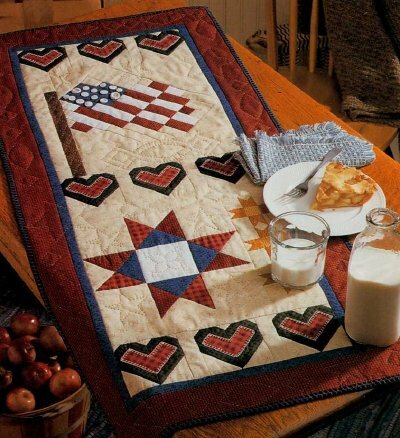 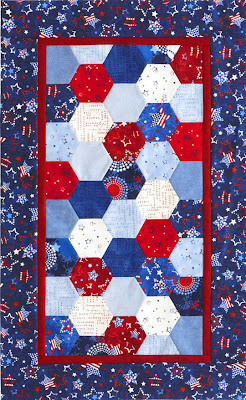 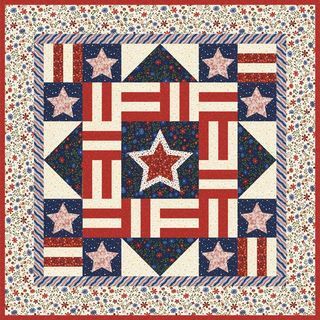 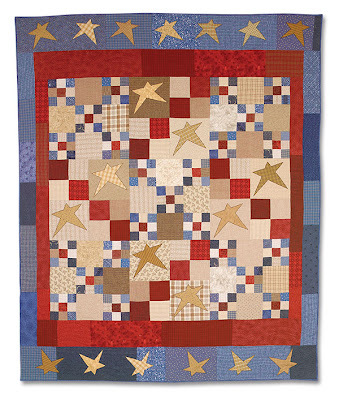 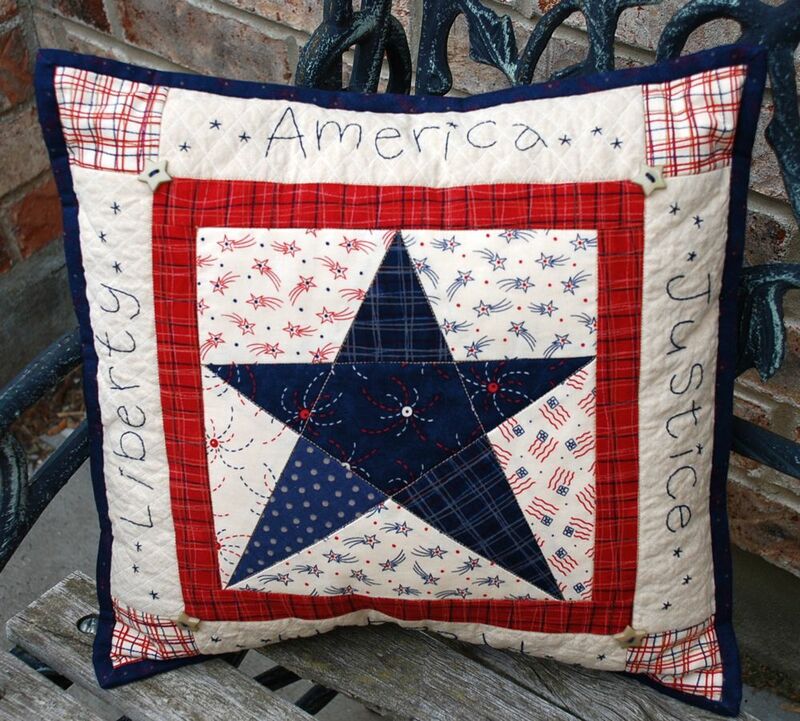 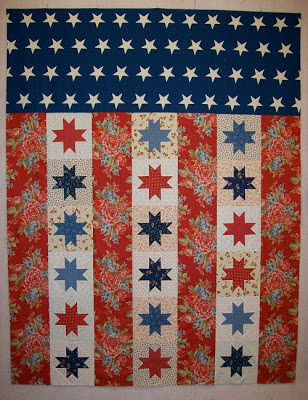 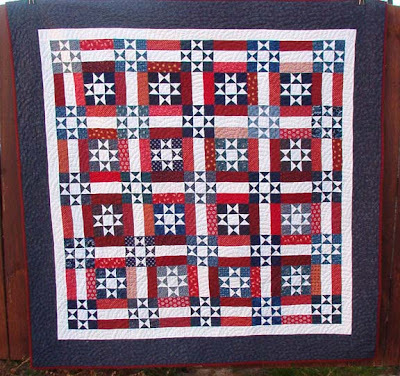 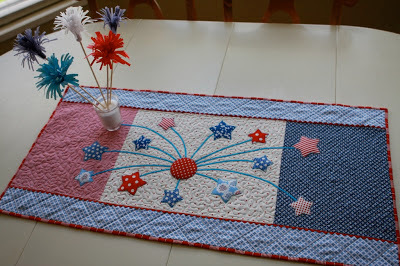 This post was recently updated... please link over to our latest Free Pattern Day for Patriotic Quilts ! 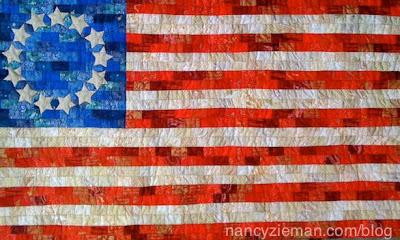 Image credits: All images are copyrighted by their owners. 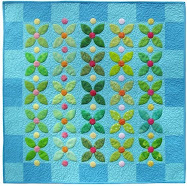 Please see the latest Free Pattern Day post for links to the original websites for these images. 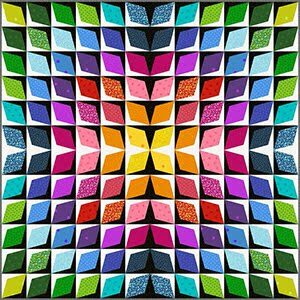 From her home in Guatemala, Central America, Priscilla Bianchi creates quilts, fabrics, and quilt patterns in a dazzling array of color. 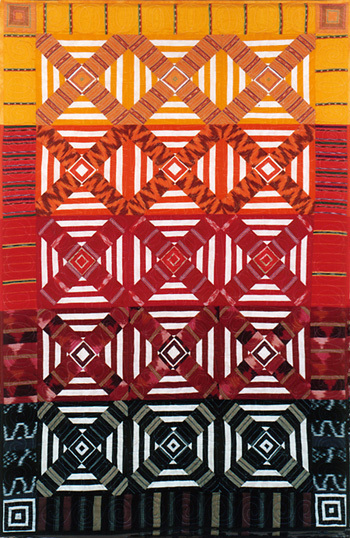 Her quilts are inspired by the vibrant "huipiles" or tunics, woven by the native Mayan women in patterns that are unique to each village. 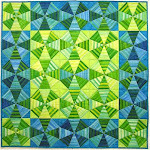 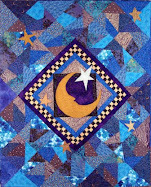 We first featured Priscilla's work at Quilt Inspiration in April, 2010. 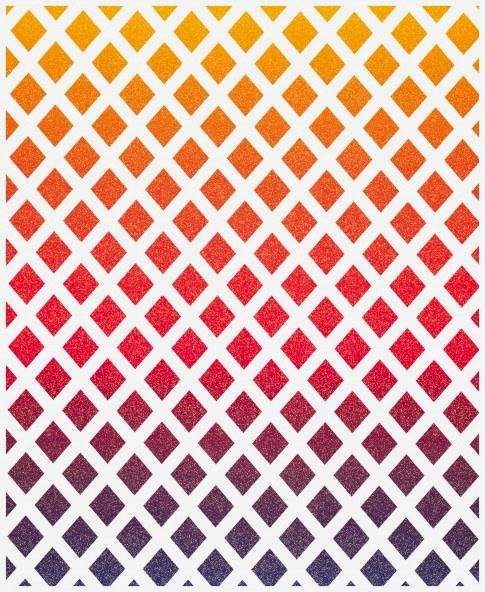 'Colors of Ildefonso' is inspired by the orderly, geometric shapes on the 'huipils' (women's blouses) from the village of San Ildefonso. 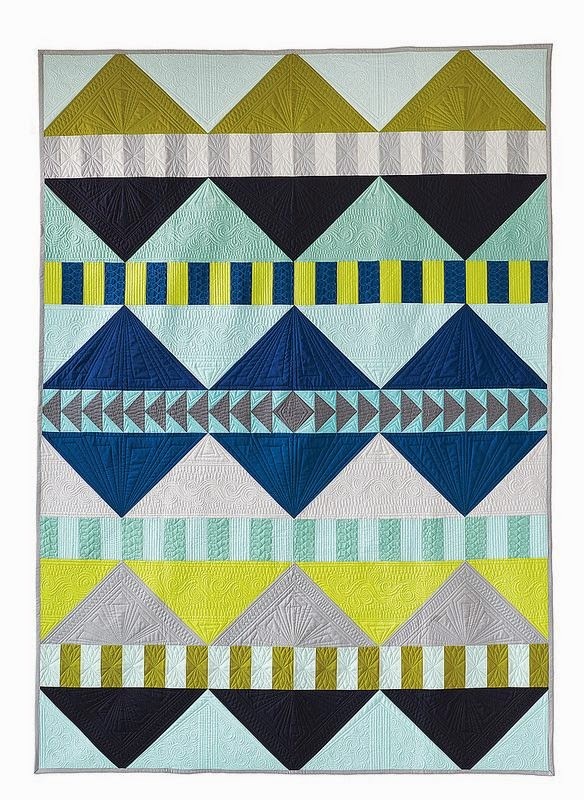 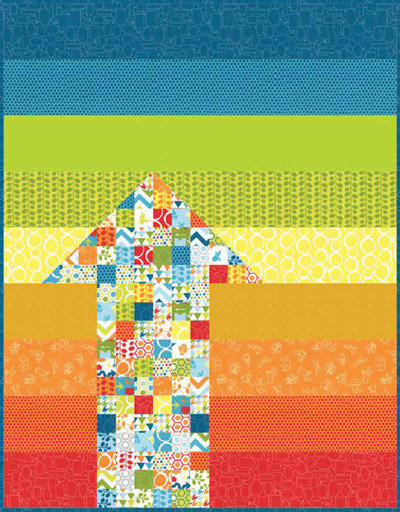 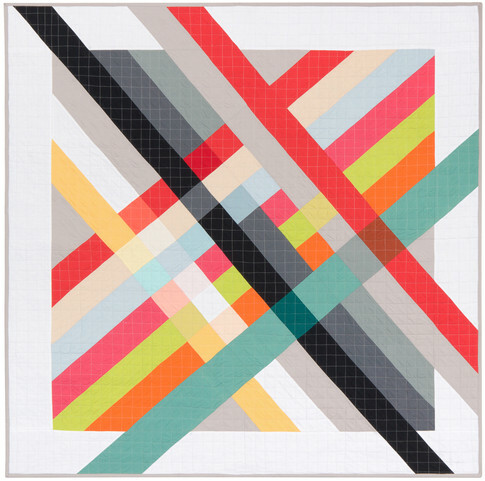 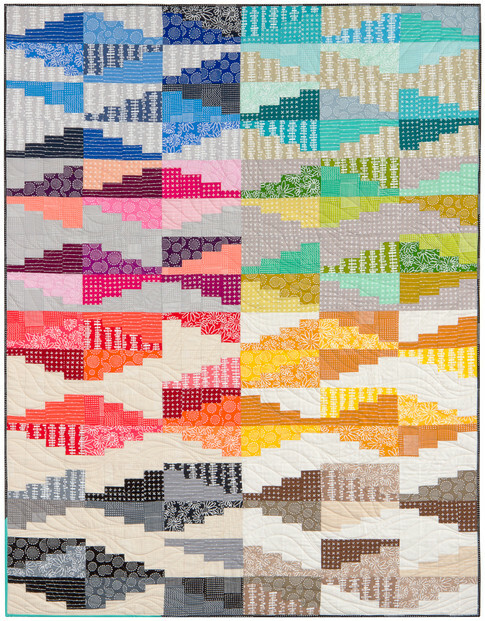 Choose interesting stripes and coordinating colors for a vibrant quilt with clean lines and high visual impact. 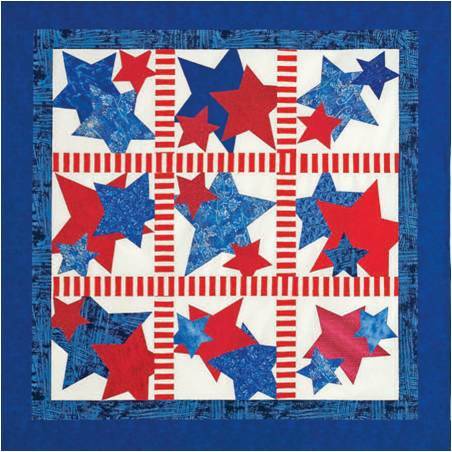 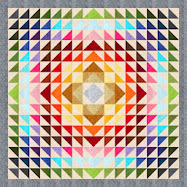 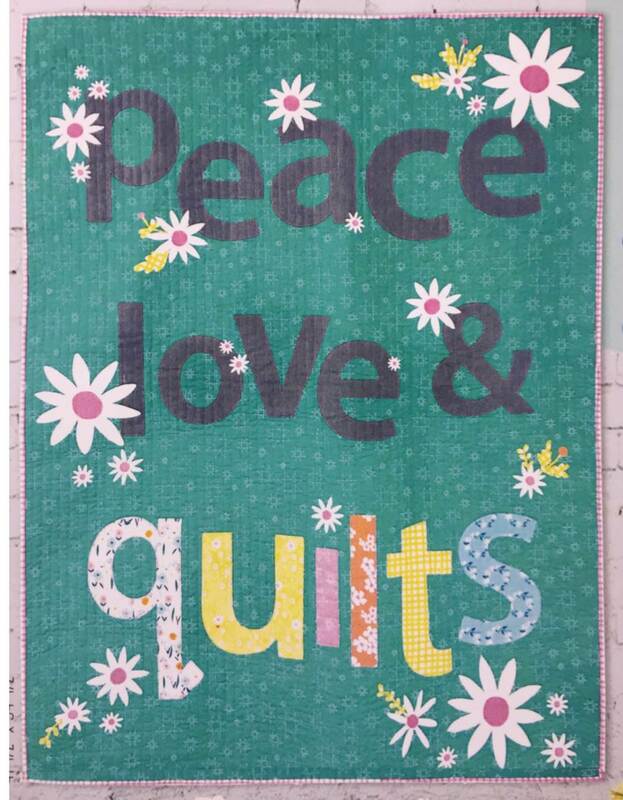 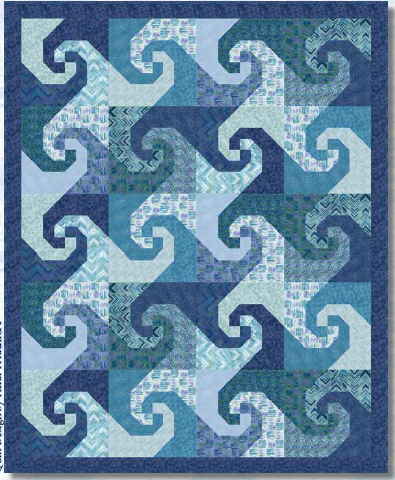 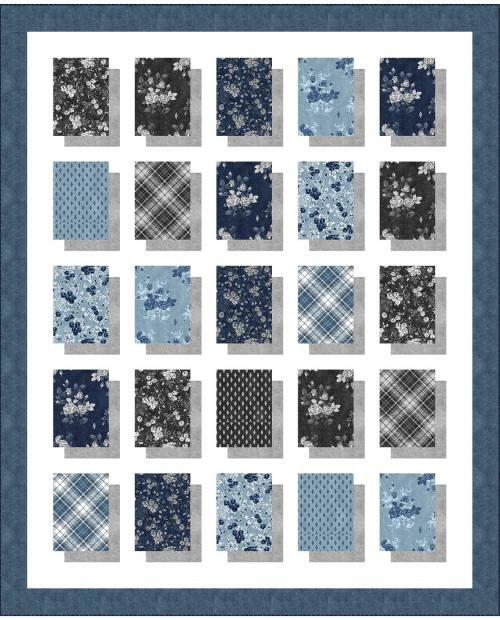 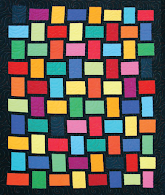 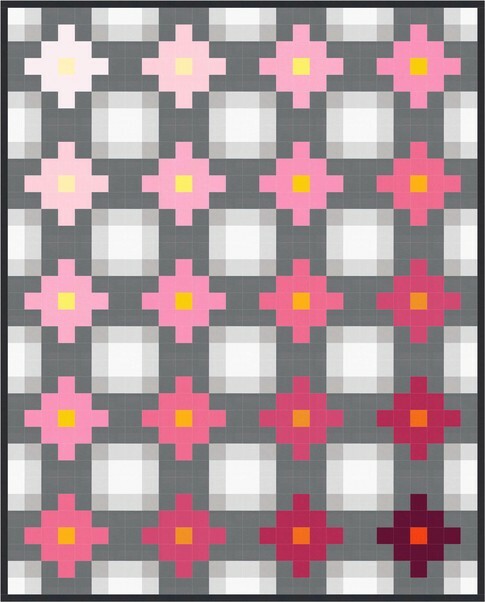 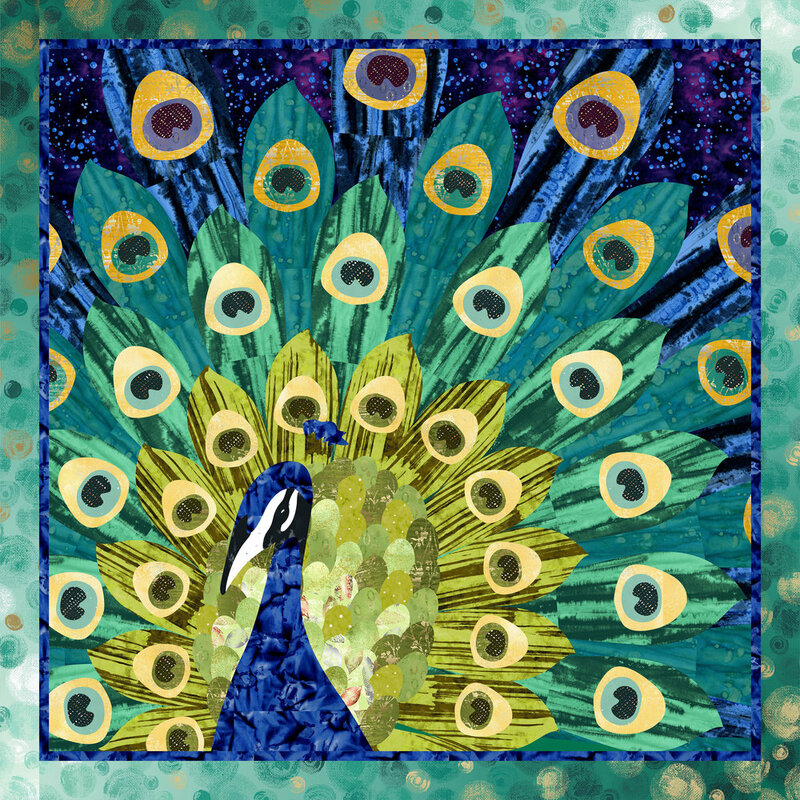 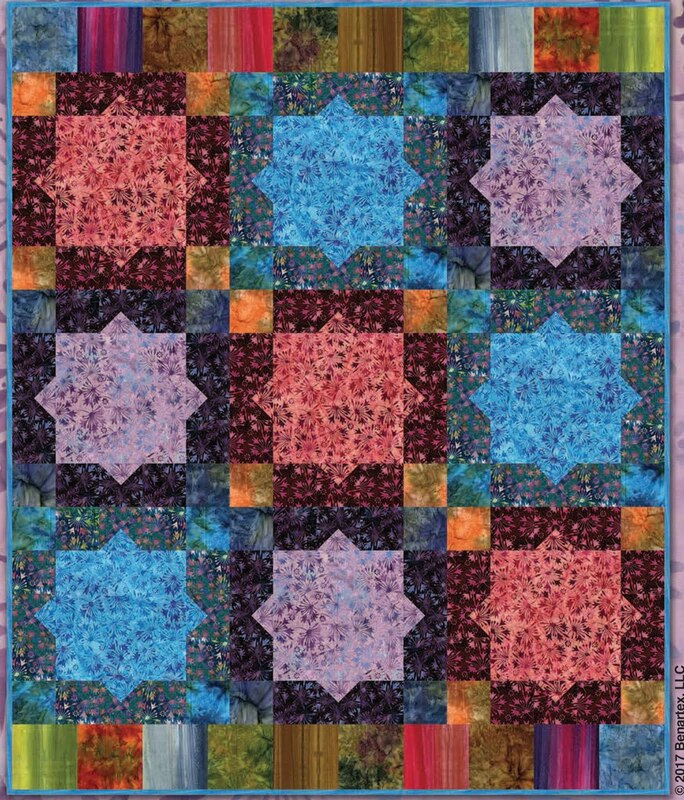 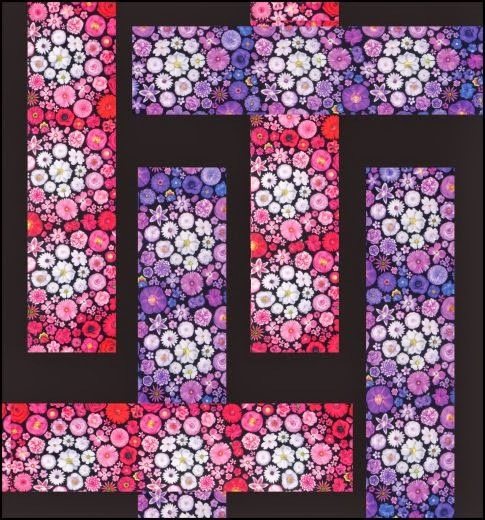 This is one of the art quilt patterns available at Priscilla Bianchi's website. 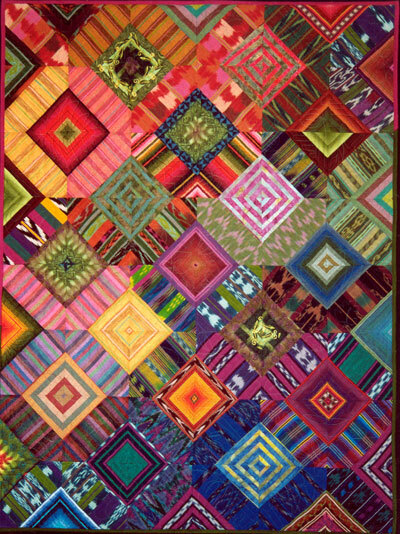 Phyllis says, "I've long been attracted to 'randas', the heavily embroidered decoration found on the front of native Mayan women's skirts. 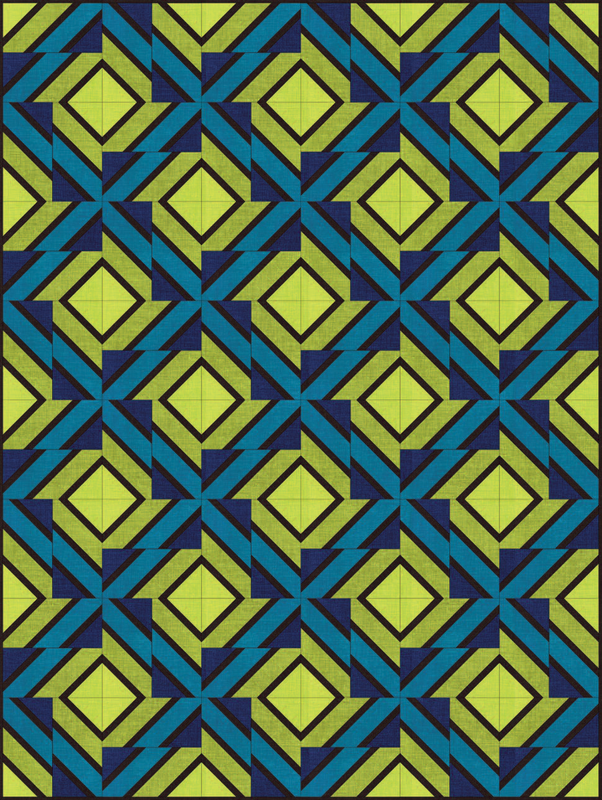 Its linear nature suggested 'weaving' to me. 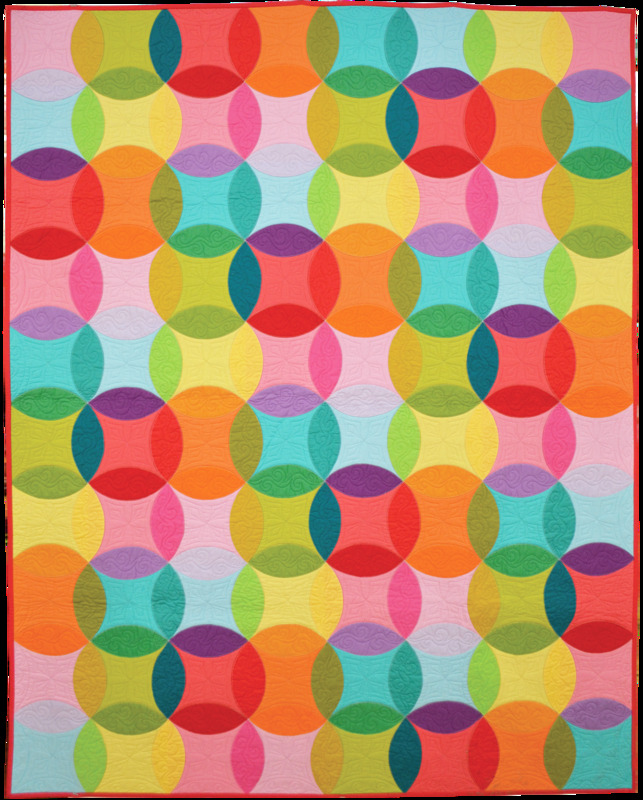 The continuous motion of weft over and under warp is the fundamental essence of textiles. 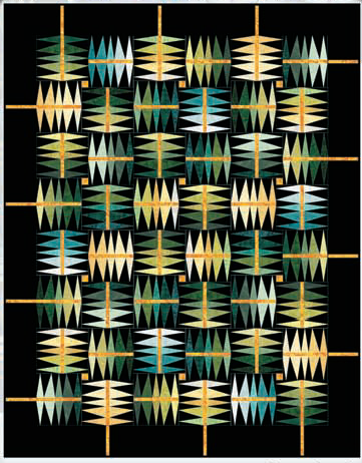 As I worked the design, it reminded me of Kente cloth from Africa." 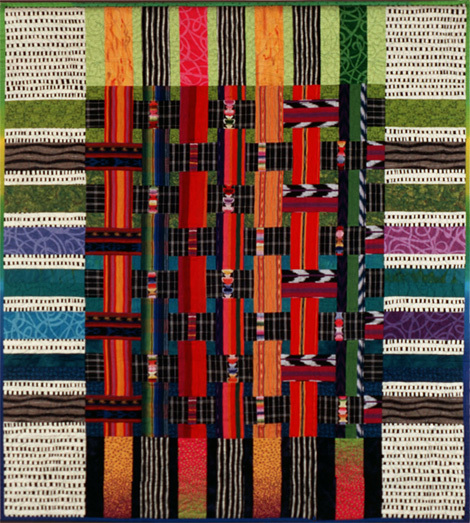 Mayan Kente is Phyllis' tribute to weavers around the world, whose skill with color and design creates a legacy of functional, beautiful clothing. 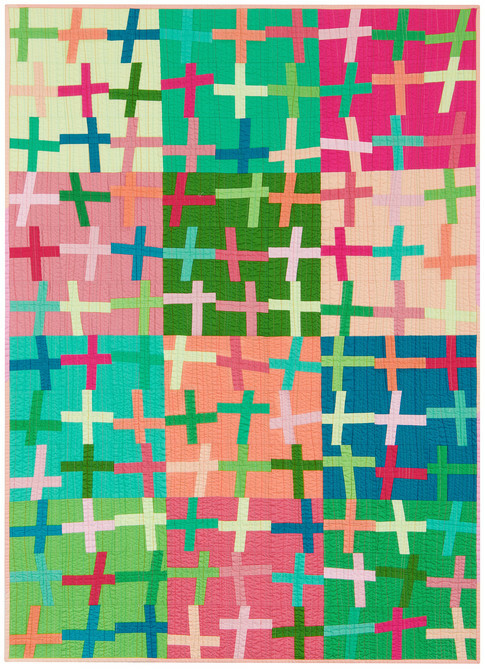 Made with Guatemalan hand-woven textiles, Indonesian batiks, and commercial cottons, "Chichi's Cross" symbolizes the community of Chichicastenango united around the sign of the cross. 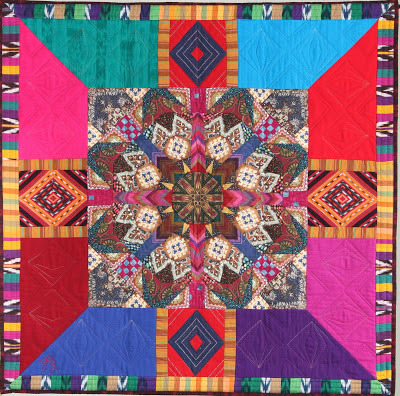 The intricately detailed kaleidoscopic center contrasts with the simple, large areas of deep color around it. 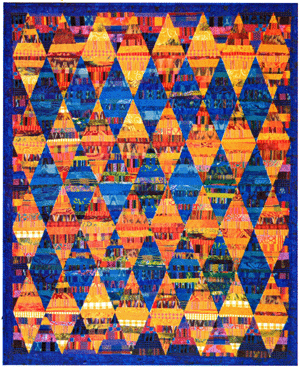 This stunning quilt was featured in a 2011 exhibit of Priscilla Bianchi's work at Museo Ixchel (Guatemala). 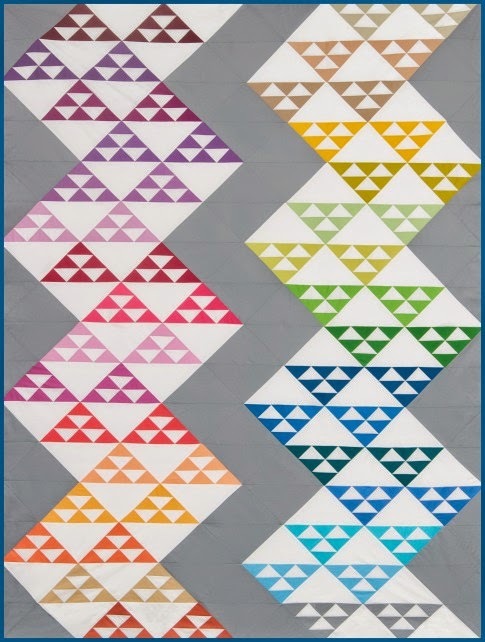 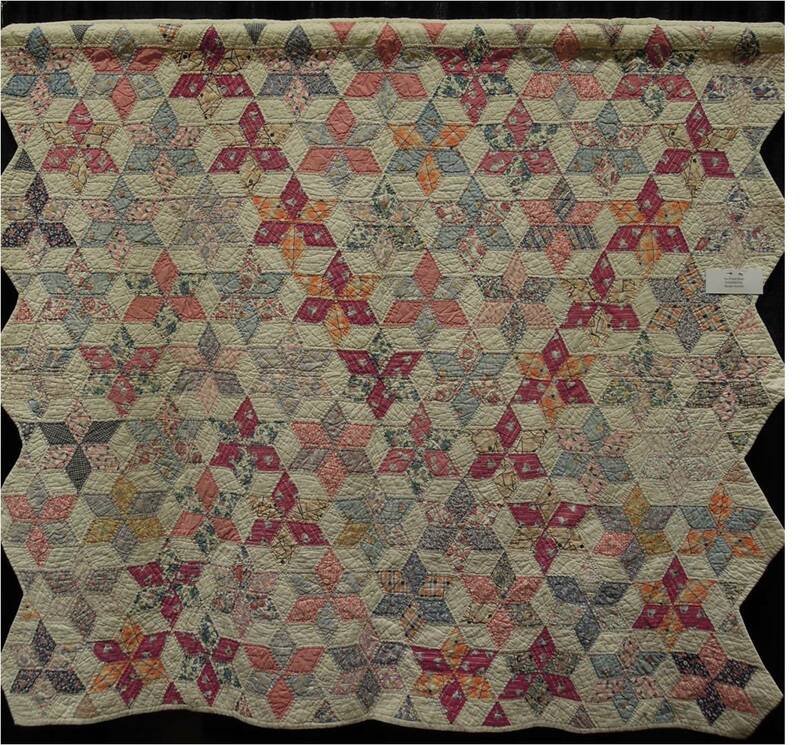 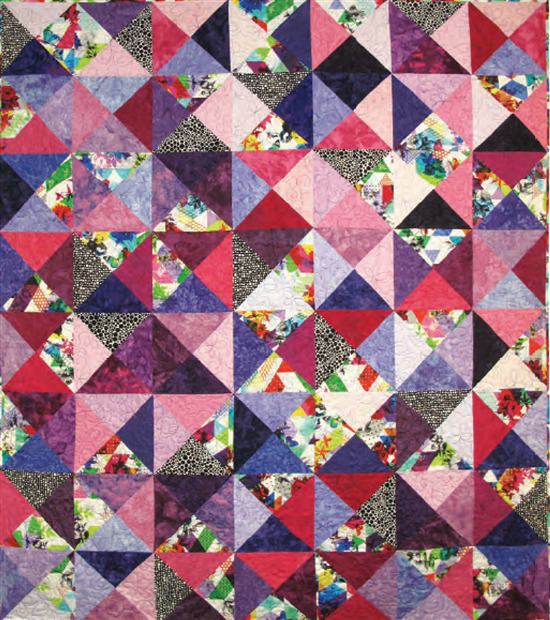 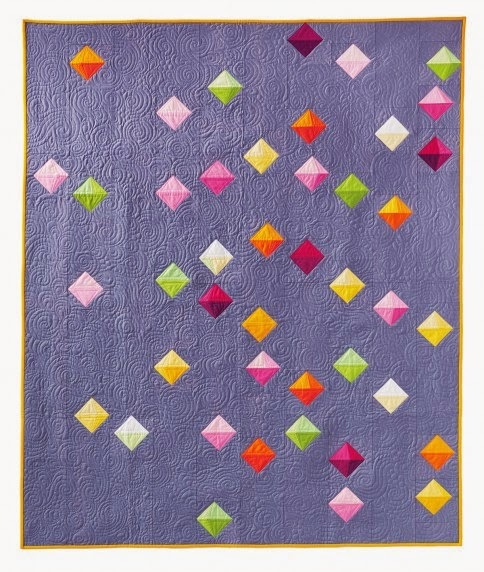 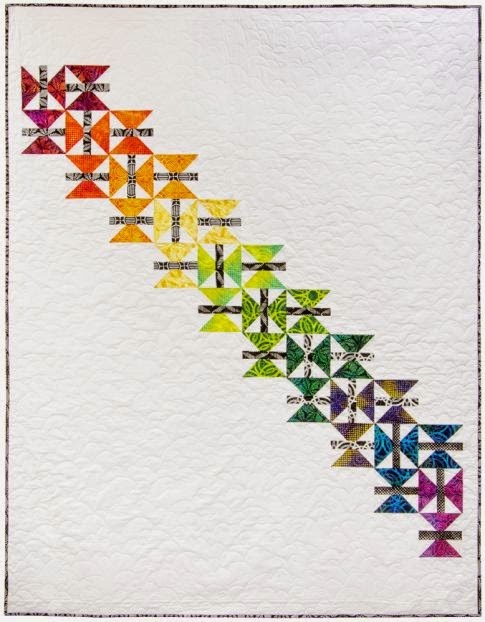 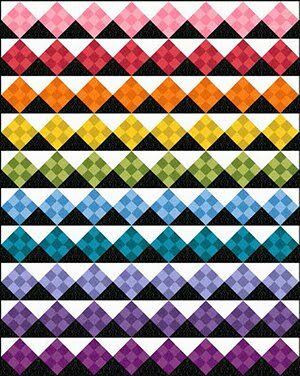 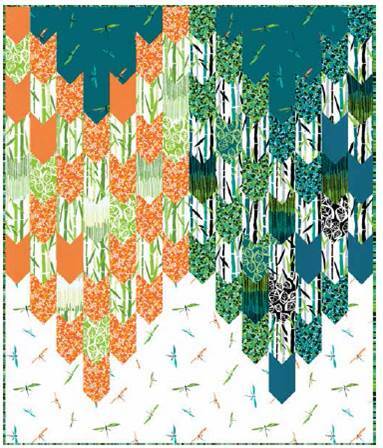 Here is one of Priscilla Bianchi's quilt patterns which is made as a string quilt; strip sets are made and then cut into triangles which are pieced together. 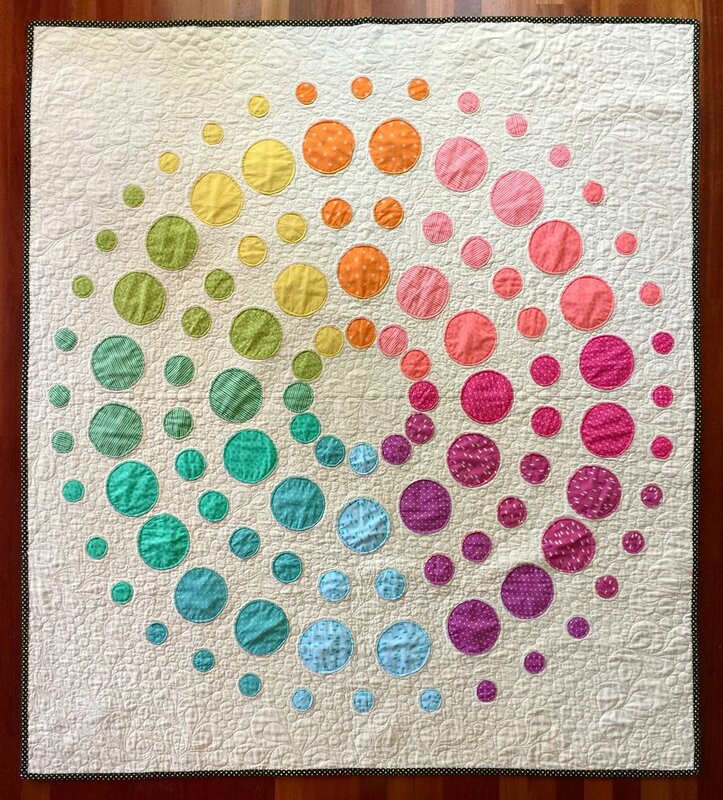 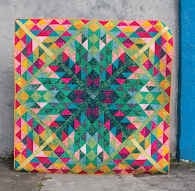 This quilt is a great way to feature colorful Guatemalan fabrics, or, to use up scraps. You can read more about the design, including fabric requirements, in an article at Simply Quilts on HGTV. 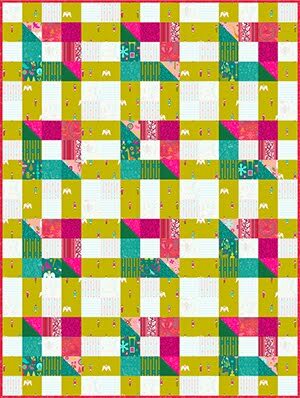 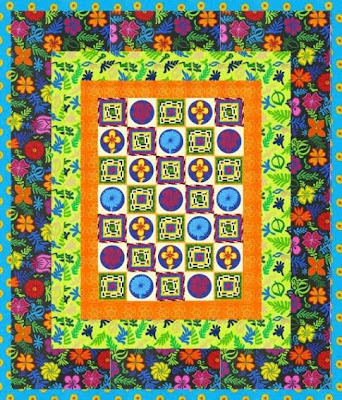 Guatemalan Flora is a free, downloadable quilt pattern which Priscilla Bianchi designed for Robert Kaufman Fabrics. 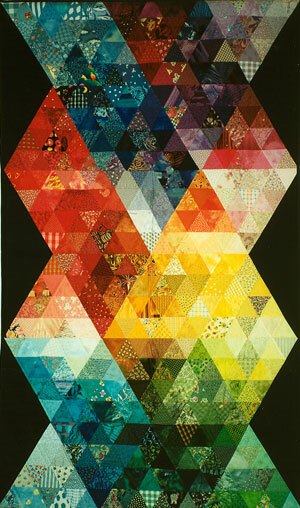 You can see her love of bold, bright, strong prints which characterize much of her wonderful work. 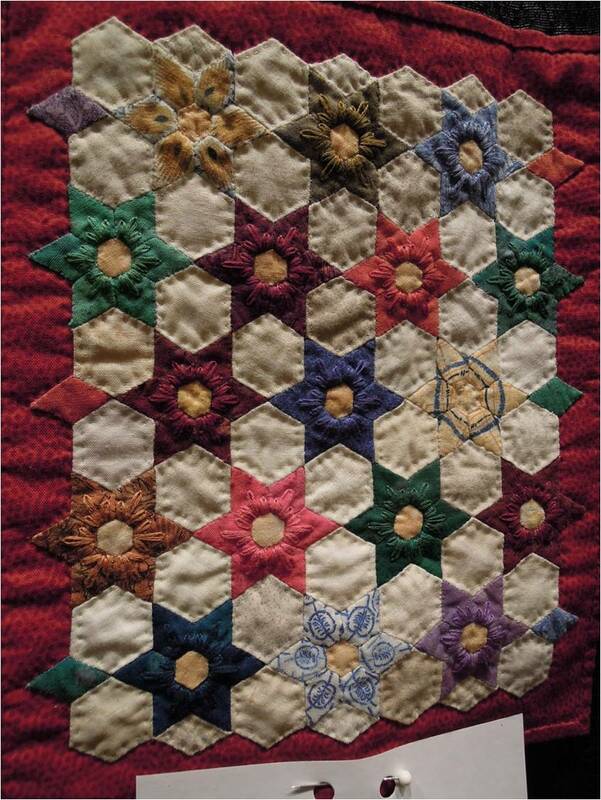 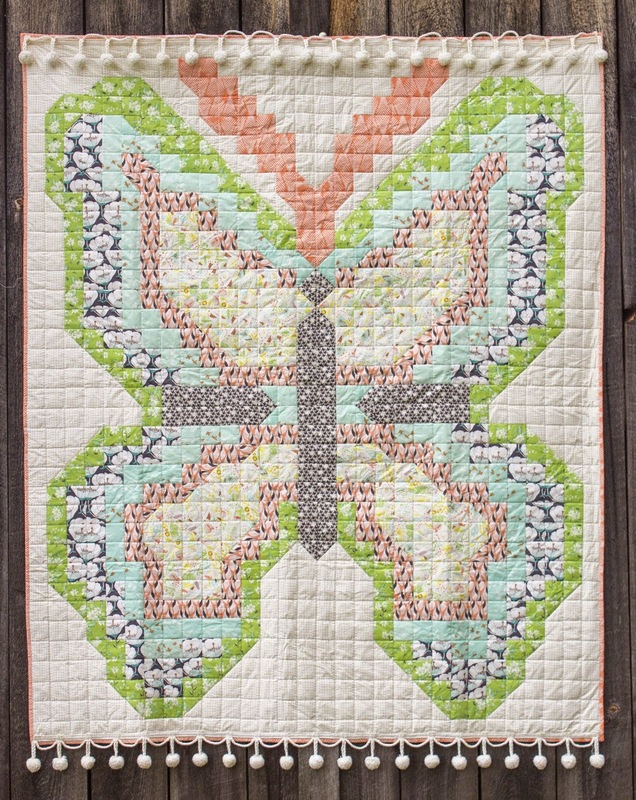 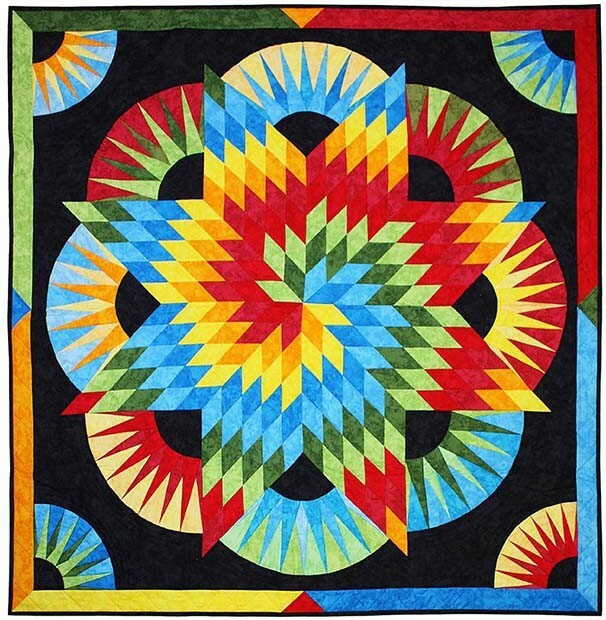 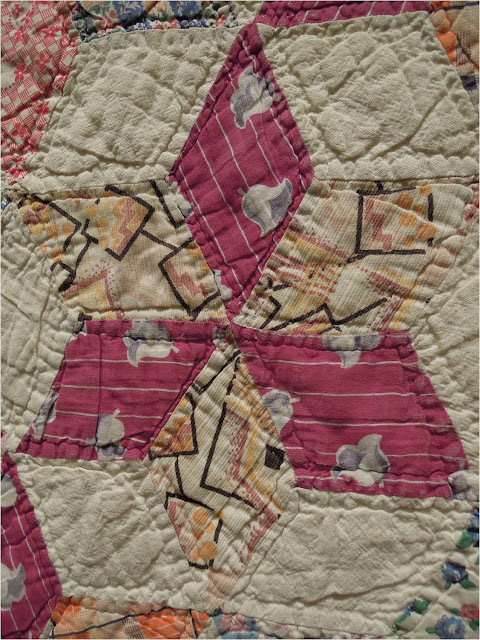 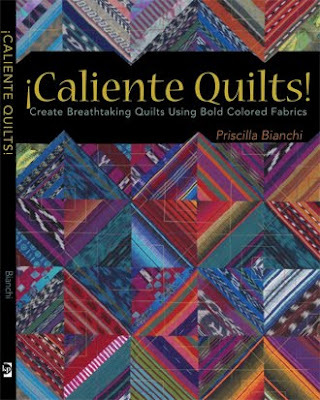 Plenty of quilt inspiration and patterns also can be found in Priscilla's book, Caliente Quilts. 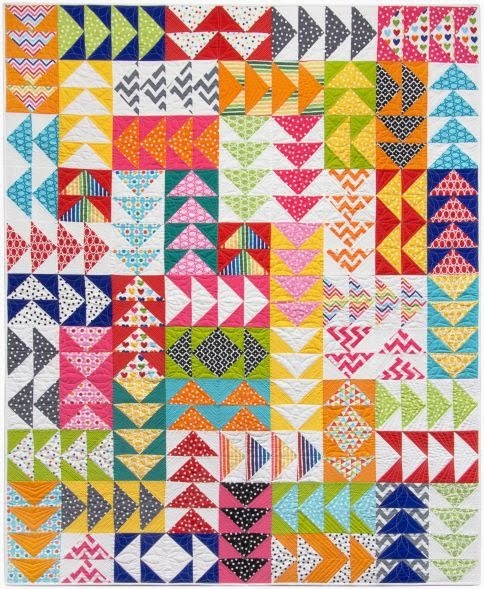 Guatemalan fabrics, similar to the ones shown in the cover quilt above, can be purchased at Priscilla Bianchi's online store, here.